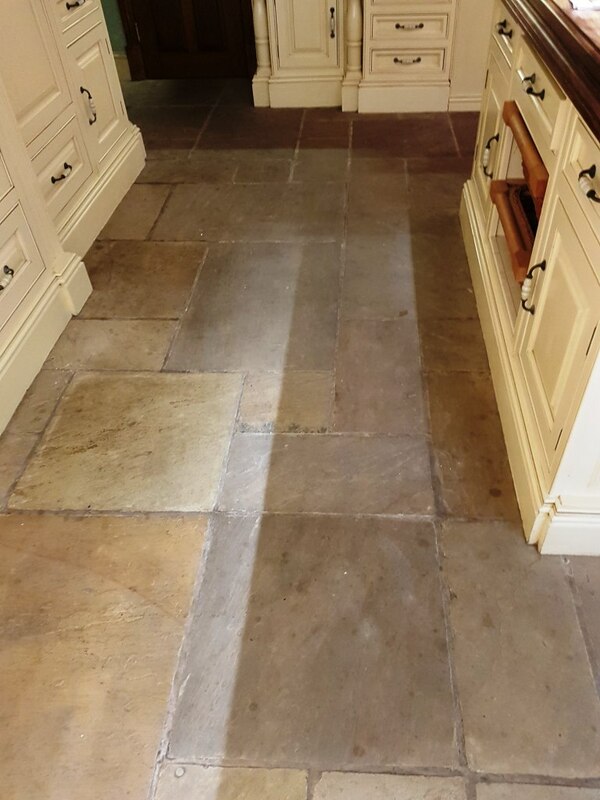 This customer who lived in the old Sussex village of Vines Cross near Horam, had a lovely Flagstone floor installed in the Kitchen some years earlier but because they wanted a completely natural look no sealer had been applied. With no protection in place dirt had become ingrained into the pores of the stone over time making it dull and difficult to clean effectively. 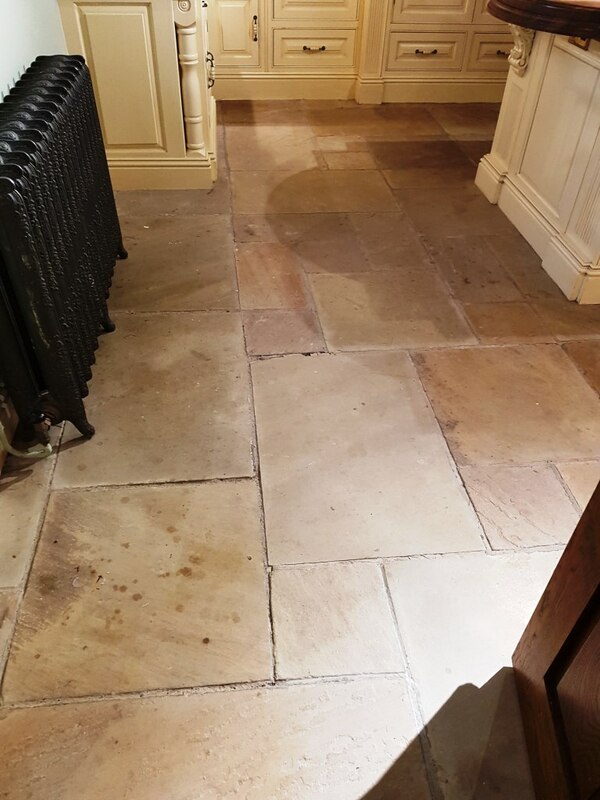 Their beautiful flagstone floor no longer looked as it should and the owner of the house was keen to have it deep cleaned and looking its best again. I was happy to do the work and before starting I made sure to discuss the topic of sealing and recommended one called Tile Doctor Ultra-Seal which is a natural look sealer that doesn’t change the look of the stone yet protects it from dirt becoming ingrained. With no sealer evident on the stone there was no need to use a coatings remover on the tiles, so after protecting the Kitchen units and skirting board with plastic tape I started with a combination of Tile Doctor Pro-Clean tile and grout cleaner mixed with a small amount of another Tile Doctor product called NanoTech HBU. HBU stands for Heavy Build-Up and this product utilises nano-sized abrasive particles to assist in the cleaning process. The solution was left to dwell and soak into the stone for ten minutes before being scrubbed in using a rotary buffing machine fitted with a black pad. With the cleaning solution on the floor I also took the time to run a stiff brush along the grout lines to make sure they were also scrubbed clean. After a while the cleaning solution became dirty with all the soil that was being released from the tile and was then extracted using a wet vacuum. The floor was then rinsed with water and stubborn areas re-treated using the same process until I was satisfied it was thoroughly clean. After giving the floor a final rinse and drying it as much as possible with a wet vacuum it was left to dry off fully overnight. I returned the next day to seal the floor first checking it for dampness using a damp meter. All was well, and the flagstones were dry, so I was able to proceed with sealing the stone. 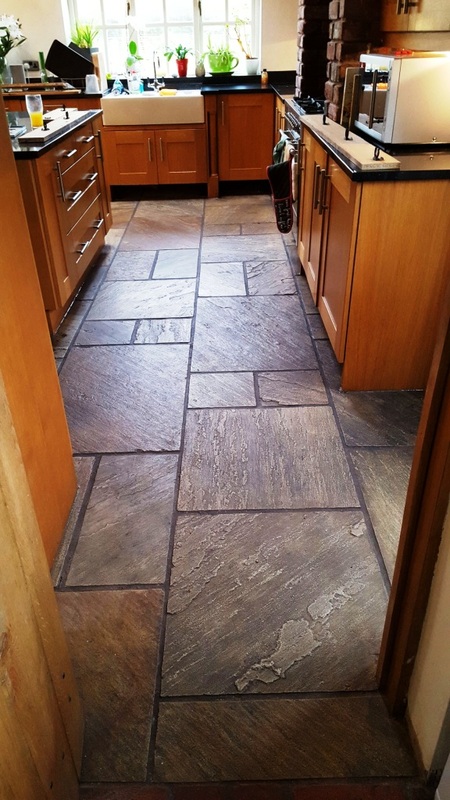 As I mentioned earlier my client liked the natural look but having experienced the problems of maintaining an un-sealed floor had agreed for me to seal it with Tile Doctor Ultra-Seal. I applied a single base coat of Tile Doctor Ultra Seal as agreed and then recommended that we add a coat of Tile Doctor Seal and Go as well, just to brighten up the floor and add a slight sheen. I knew from experience this would work well on Flagstones and my client was happy to trust me. As suspected the combination of the two sealers was a winner and my client was overjoyed with the resulting effect and more so that she can now maintain it satisfactorily. Quarry Bank Mill is an old textile mill just outside of Wilmslow in East Cheshire that dates back to the Industrial Revolution when it was used to produce cotton. The mill is now under the care of the National Trust who recently put together a £9.4 million project, supported by the Heritage Lottery Fund the further restoration of the mill and its gardens. 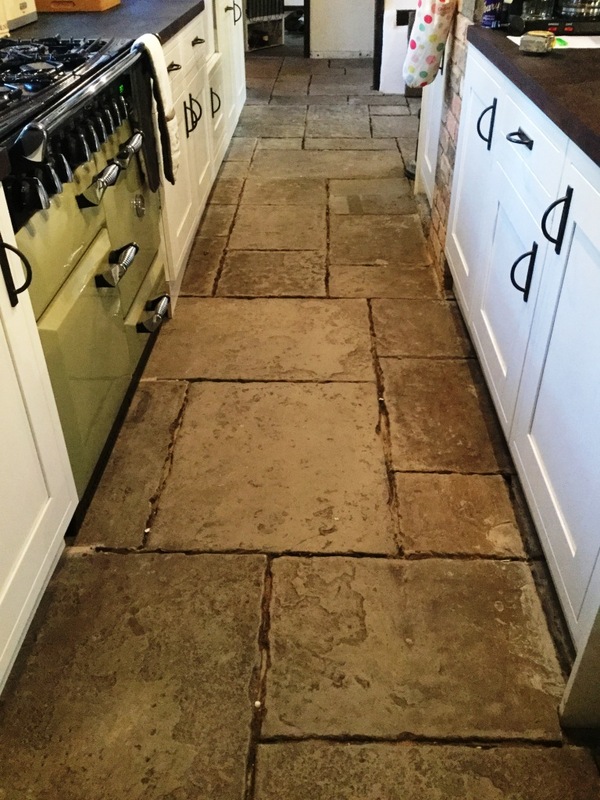 The 18th century mill is now a popular attraction and I was recently asked to clean and seal the Sandstone flooring in the Kitchen of the head gardeners cottage. The cottage is actually located in the formal gardens which were recently visited by HRH Price of Wales. 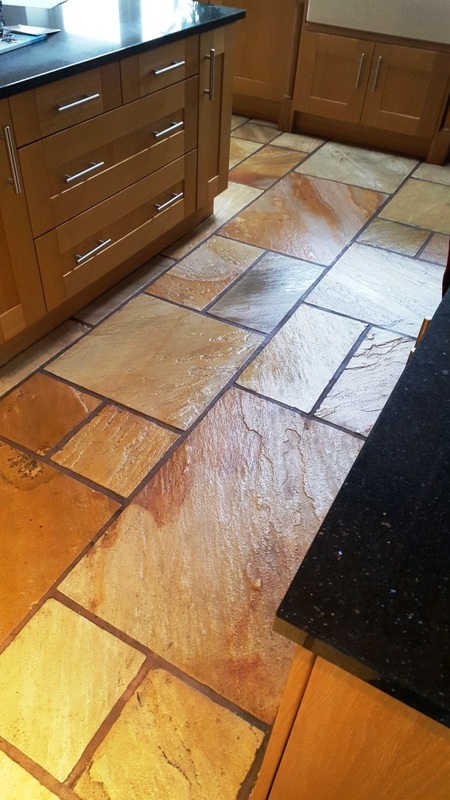 The Sandstone Kitchen floor was in good physical condition so unlikely to be the original however like any stone floor in constant use the sealer was wearing off and dirt was becoming ingrained in the pores of the stone detracting from its overall appearance. Our first job was to protect the wooden kitchen units and other woodwork with tape. Next I set about cleaning the Sandstone and stripping any reaming sealer off in the process. To do this I applied a strong dilution of Tile Doctor Remove and Go, which is multi-purpose stripper and cleaner. The product strips away any old sealer on the tiles and draws out ingrained dirt, stains and heavy grease build-up. I applied the product and left it to soak for roughly fifteen to twenty minutes to allow time to break down the old sealer and penetrate the pores of the stone to reach any embedded dirt. Next, I scrubbed the floor using a specialised buffing machine fitted with a black scrubbing pad swelled with water to get the stone clean. The resulting dirty cleaning slurry was quickly soaked up using a wet vacuum and after rinsing with water With the floor clear I was able to spot stubborn areas that need more work and repeated the process. With the stone clean I turned my attention to the grout lines and scrubbed in a strong dilution of Tile Doctor Pro-Clean which was then rinsed off with water. I then completed another spot check of the floor whilst using the wet vacuum to get the floor as dry as possible. With the cleaning part of the job complete I left for the day to allowing the floor to dry off fully overnight. Upon returning to the property the following day, I tested the floor with a damp meter, checking for any excess moisture that could prevent me from sealing the stone. 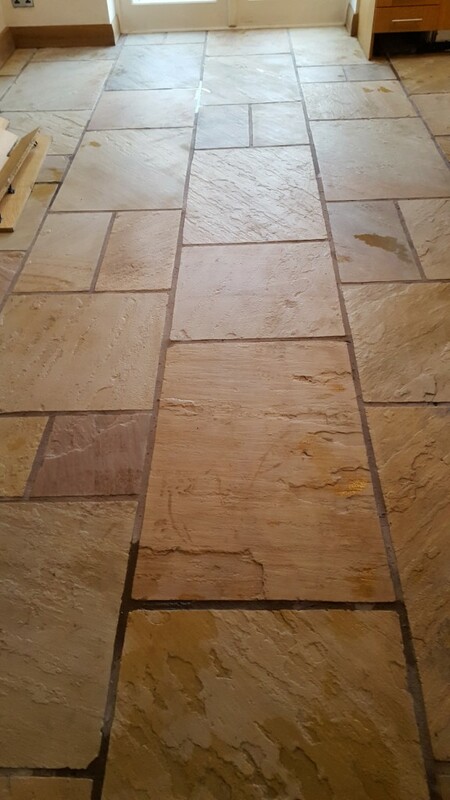 The floor proved dry and so I began to seal the Sandstone starting with a single coats of Tile Doctor Colour Grow. Colour Grow is an impregnating sealer that is designed to fill the pores of the stone blocking dirt from becoming ingrained there whilst enhancing the natural colours in the stone at the same time. Once the Colour Grow was dry I followed with the application of five coats of Tile Doctor Seal and Go which is a compatible water-based acrylic sealer which provides both a stain resistant surface seal and a durable low-sheen finish. The floor now looks much healthier and the new sealer show keep it looking that way for some years to come. 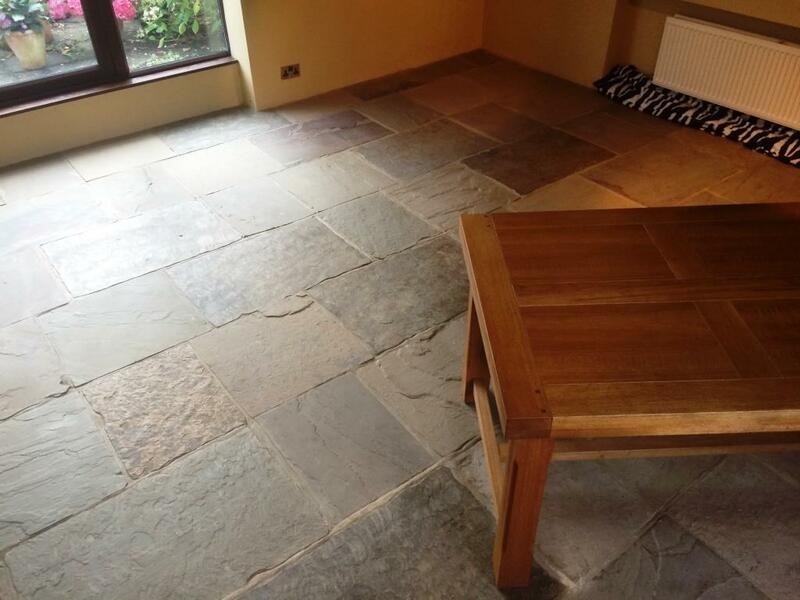 This customer in Great Harwood was so fedup with their Flagstone tiled flooring on the ground floor of their property. In fact they were ready to take up the floor, put a new concrete base in place and lay a wood floor down on top. 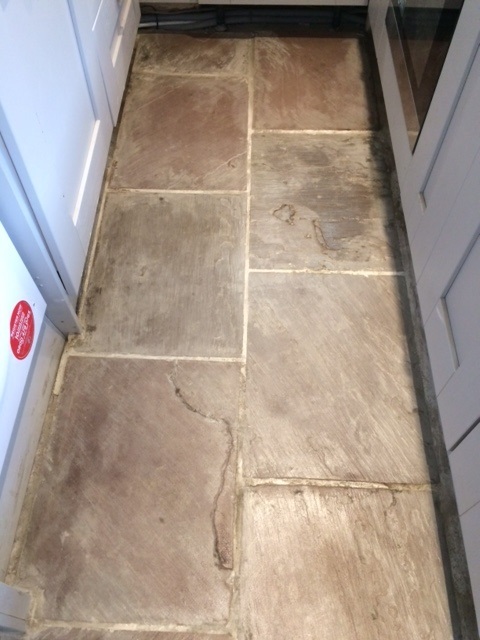 However this is the original floor from when the house was built in 1894 so was not replaceable as such, and the customer really wanted to restore the floor back to its original condition, as well as other material’s in the house, to recreate the Original Victorian feeling that had been missing for many years. We have completed quite a lot of this type of work for customers in the past and we publish all out work on our website and it was one job similar to this that convinced the customer that we had the answer to her problem. A few years ago Tile Doctor invented a system called Milling to deal with problematic stone floors like this one. The system uses very coarse Diamond pads fitted to heavy machinery to mill the stone until it is a smooth as possible. This action gets rid of years of traffic marks, ingrained dirt as well as old wax and sealers. There’s nothing harder than Diamond so we find this system woks really well on an old damaged floor like this one. The process will leave the stone looking rough so once finished with the coarse pads we then apply a lighter Diamond grit pad to remove the scratch marks that the heavy diamond grits leave behind. The floor is rinsed between pads and a little water is also used to provide lubrication. 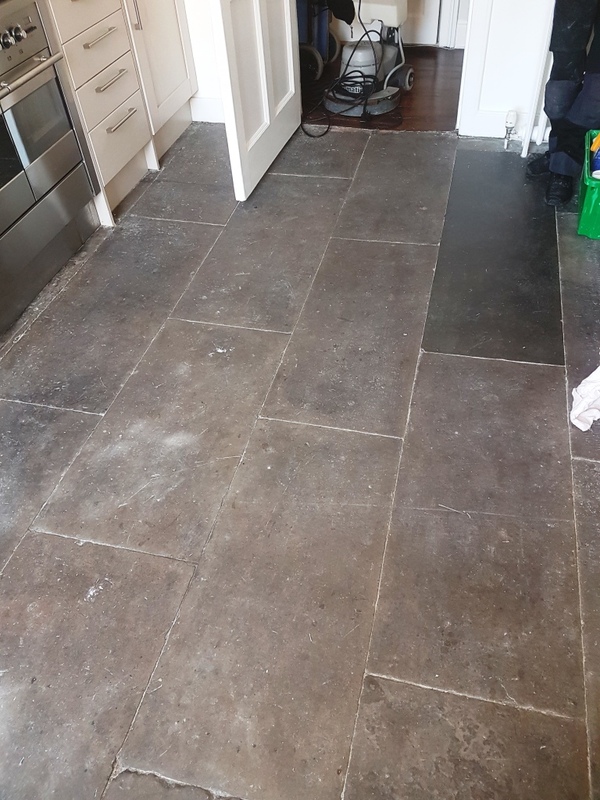 After resolving the stone issues we re-grouted the whole floor and conduct one more final clean using Tile Doctor Neutral Clean before leaving it to dry out ready for sealing a few days later. 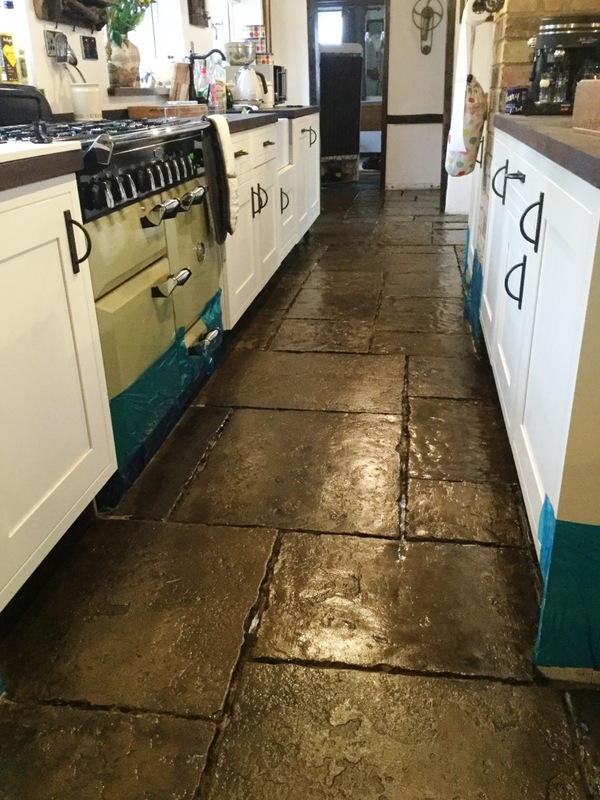 On our return the sealer we chose for these old flagstone was Tile Doctor Colour Grow, it penetrates into the pores of the stone protecting it from within and in the processes lift the natural colours in the Stone. Colour Grow is a breathable sealer which you need when sealing these old stone floors which won’t have a damp proof membrane installed. A wet look or polishing sealer will eventually spoil in damper wetter weather. 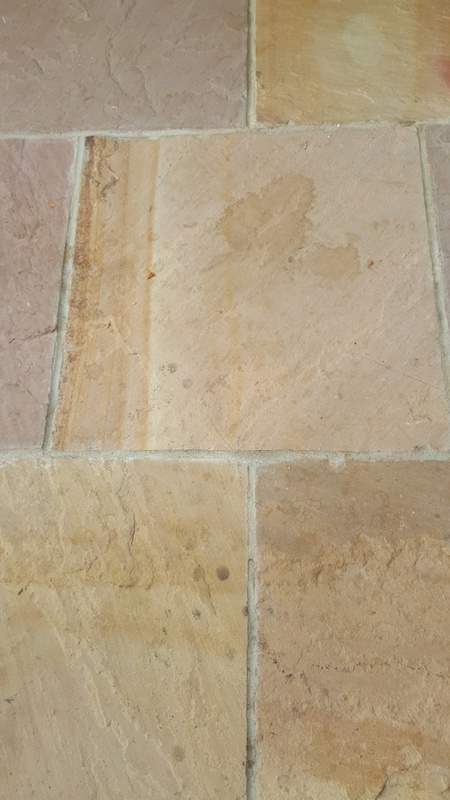 Another advantage of Colour Grow is it leaves a Matt finish which is a more natural look for Sandstone Flagstones like these. They will also be easier to clean as the milling process made the stone much smoother to the touch, so it becomes a lot easier to maintain in the future. The results were fantastic, and the customer is really pleased that they will no longer have to replace the tiles. 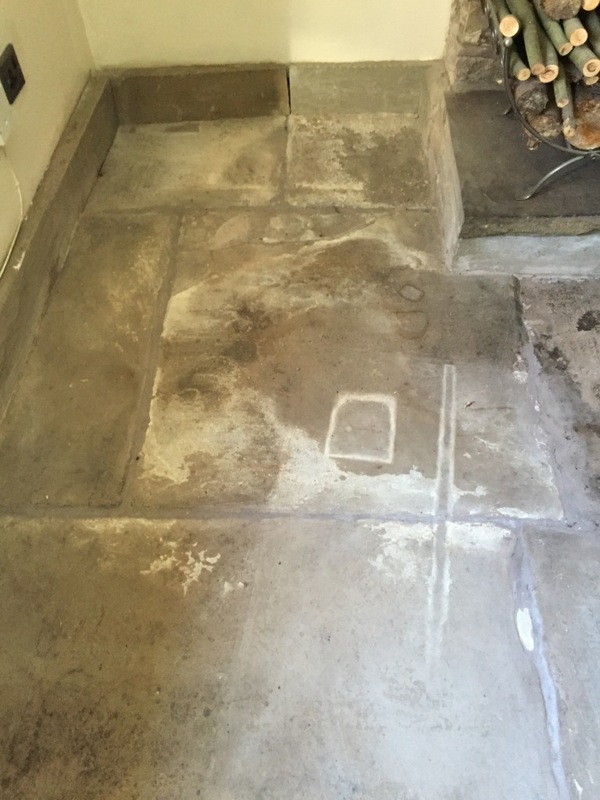 The appearance and condition of the Flagstone had been improved so much that most people would not believe it had been laid 123 years ago! Minchinhampton is an ancient market town located on a hilltop in the Cotswolds area of Gloucestershire, famous for being one of the UK’s areas of outstanding beauty. The town has a long history and many of the residents live in some truly picturesque and characterful cottages that date back to the 18th century and beyond. I was recently contacted by a property owner in the village. 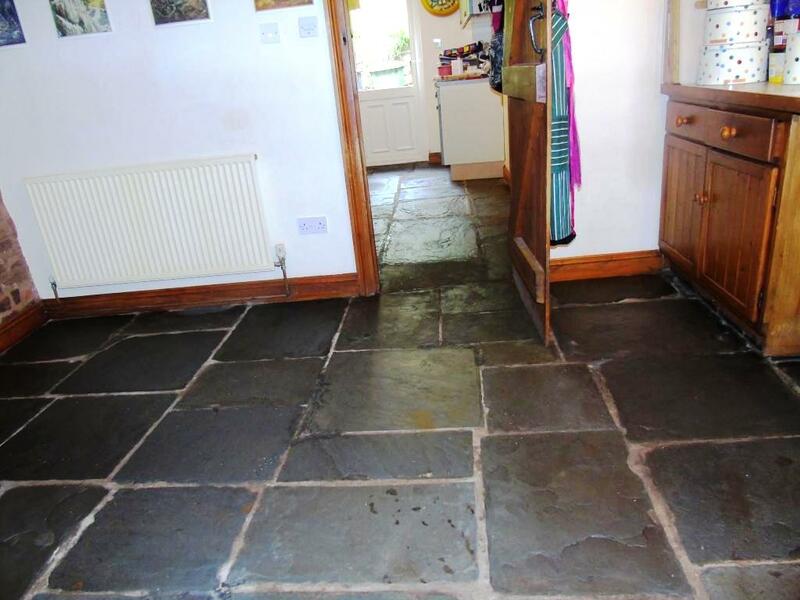 She had just uncovered an original Flagstone tiled floor in her cottage, which dates to 1765. The floor had previously been covered by a wooden floor and the property owner was keen to see if I could restore it. We’ve had some fantastic success with restoring similar floors in the past, so I was more than happy to see what could be done. I visited the property initially to conduct a test clean and check that I would be able to remove the copious wood adhesive left on the floor after the covering had been lifted. This test clean was successful, and the customer booked me in for complete the full restoration straight away. My first action in the process of restoring the floor was to mix a strong solution of two products – Tile Doctor NanoTech HBU and Tile Doctor Remove and Go. Remove and Go is designed to strip away any old sealer on the floor and dissolve any adhesive and paint stains, while NanoTech HBU is a potent cleaner which uses nano-sized particles to penetrate deep into the stone and eliminate ingrained dirt. This solution was applied across the floor and left to dwell for 40 minutes. Then, using a poly-brush fitted to a floor buffing machine, I cleaned the floor and in doing so removed 85 percent of the ingrained dirt. To tackle the rest of the ingrained dirt, I spot cleaned the stubborn area using Tile Doctor Acid Gel in combination with a handheld steamer. Acid Gel is a concentrated mix of phosphoric and hydrochloric acids. I also used a handheld buffing machine fitted with a Coarse 100 grit diamond encrusted pad to grind away any outstanding dirt and level off the surface of the tiles. When I was satisfied with the results of the cleaning process, my next operation was to replace all the missing grout on the floor. I did this using a Limestone grout, which was a good colour match for the Flagstone. With the first day of work complete, I left the floor to dry out for the next three days. With the floor being particularly old, it was important to give it a long period to dry to help avoid any damp issues. Upon returning to the property, I ran some quick damp tests to check the floor could be sealed. When satisfied that there was no excess moisture to deal with, I proceeded to seal the floor with three coats of Tile Doctor Seal and Go, leaving 30 minutes to dry between coats. This will give the floor robust protection against ingrained dirt along with the high-quality satin finish the customer had requested. Seeing the result, the customer was really pleased with her floor. 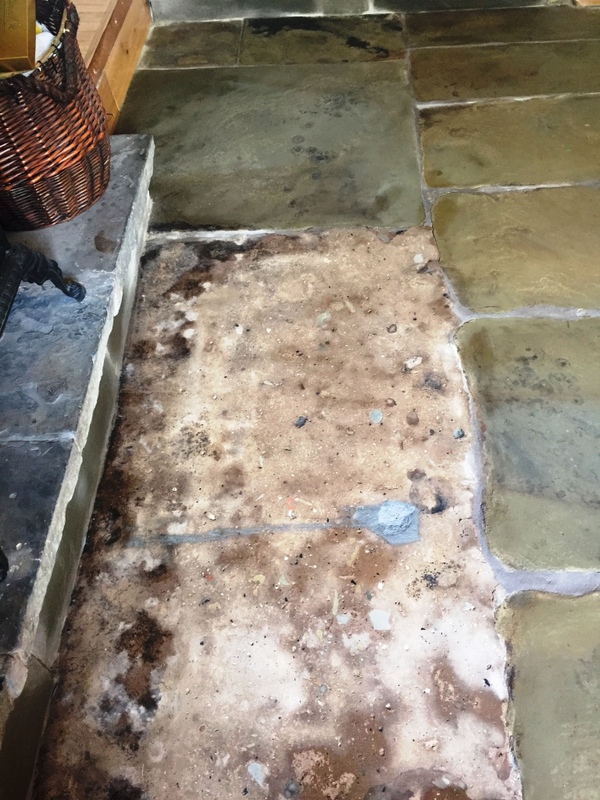 She had previously thought there was nothing that could be done to restore these old Flagstones, but with the right combination of products and cleaning methods I was able to achieve a fantastic restoration. Another satisfied customer. Bramhall is an affluent area of East Cheshire and home to some truly fantastic properties with equally impressive floors. I recently had the pleasure of visiting one of these properties to attend to a Sandstone tiled kitchen that was looking past its best. Sandstone has been used as a building material since ancient times, with some famous examples of Sandstone architecture being the Strasbourg Cathedral in Strasbourg, France, and Angkor Wat in Cambodia. Of course, Sandstone is also commonly used for paving and tiled floors. It is typically very porous, meaning that dirt and stains can easily become ingrained if the stone is not taken care of correctly. 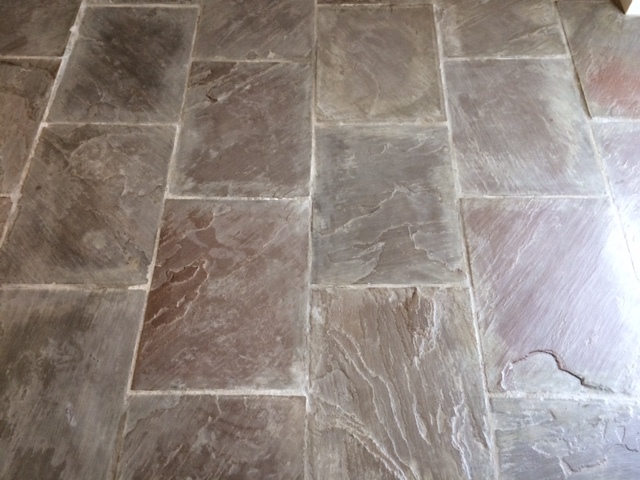 The wonderful natural shades in the Sandstone quickly lose their character and, as was the case with this floor, the tiles become dull and unappealing. To clean this floor, I first mixed a strong dilution of Tile Doctor Remove and Go, which is multi-purpose stripper and cleaner. The product strips away any old sealer on the tiles and draws out ingrained dirt, stains and heavy grease build-up. It always provides consistent results and it can be used it on all kinds of tile, stone and grout to great effect. I applied the product and left it to soak for roughly 20 minutes to allow time to penetrate the pores of the stone and reach the deeply embedded dirt. 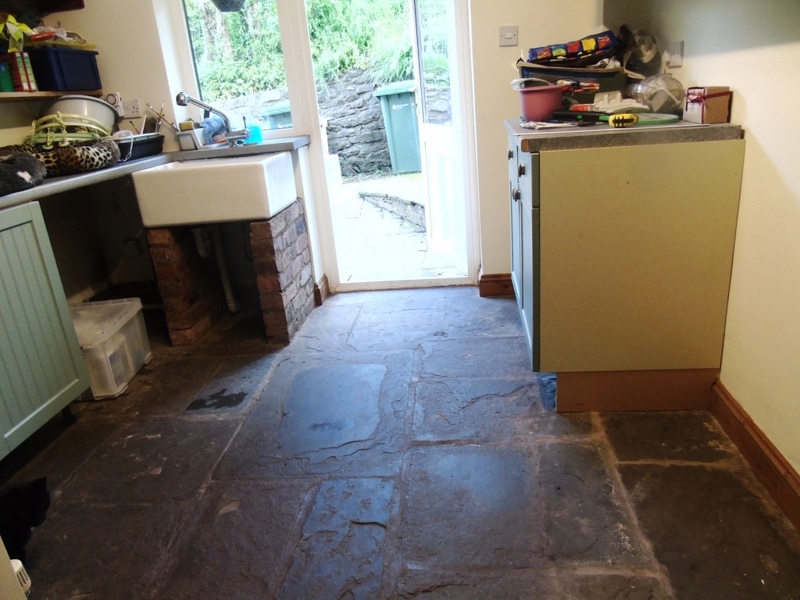 Next, I scrubbed the floor using a specialised buffing machine fitted with a black scrubbing pad to get the stone clean. The resulting dirty cleaning slurry was quickly soaked up using a wet vacuum and after rinsing with water I used the wet vacuum again to get the floor as dry as possible before leaving for the day and allowing the floor to dry off fully overnight. Upon returning to the property the following day, I tested the floor with a damp meter, checking for any excess moisture that could prevent me from sealing the stone. Thankfully the floor proved dry and I could seal the floor using two different types of sealer. First, I applied a coat of Tile Doctor Colour Grow, which is an impregnating sealer designed to fill the pores of the tiles to block ingrained dirt, as well as to enhance the natural colours in the stone. By itself, Colour Grow provides a natural-looking matte finish, but in this instance the customer had requested a low-sheen finish, so I also applied Tile Doctor Seal and Go. Seal and Go is a water-based acrylic sealer which provides both a stain resistant surface seal and a durable low-sheen finish. Looking at the before and after photos, you can see the floor underwent a real transformation. The deep clean really restored the condition of the Sandstone, while the addition of robust sealers will ensure that it is easy for the customer to keep clean in the long term. Needless to say, the customer was really pleased with the result! 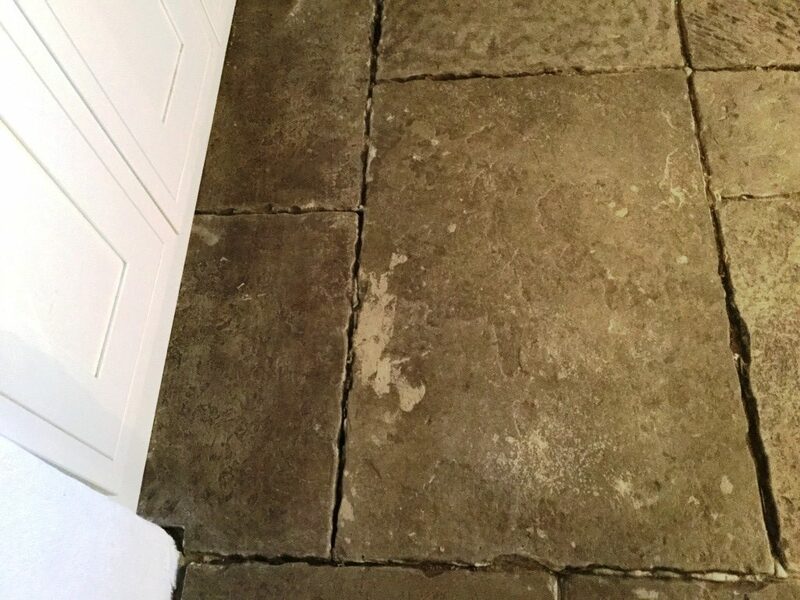 Here we have an interesting situation in which an old Flagstone tiled floor had been salvaged from a cottage approximately 30 years ago and subsequently reinstalled at a house in Ledbury, a small market town which lies to the west of the Malvern hills in the North of Gloucestershire. 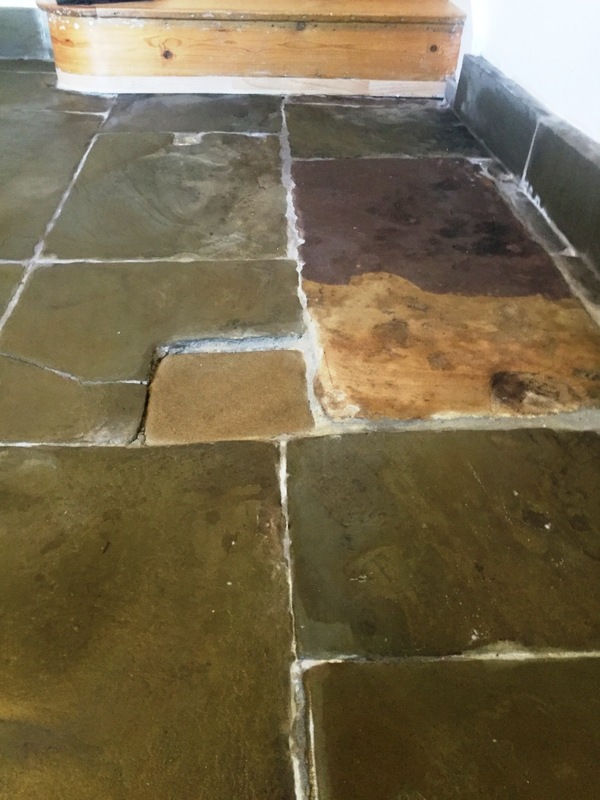 Since being reinstalled, the Flagstone tiles had been barely touched in terms of maintenance for three decades and so the stone and grout were naturally in need of a deep clean and seal! 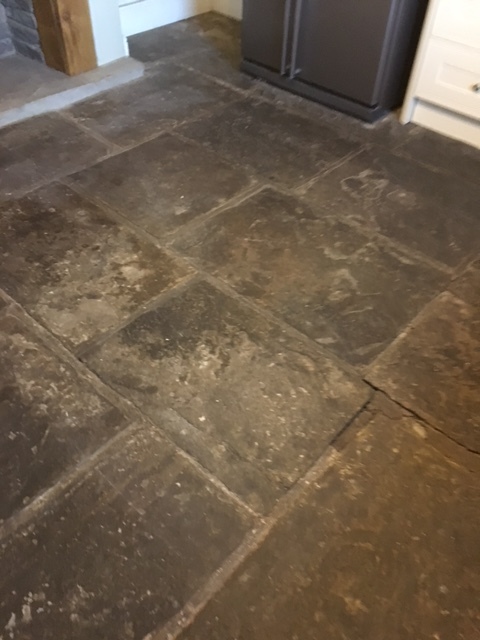 The property owner had heard about the natural stone tile restoration services Tile Doctor provides and so booked me in to see what could be done to improve the condition of his floor. My first job in the cleaning process was to distribute a mixed solution of two cleaning products across the floor. These products were Tile Doctor Remove and Go, which is a multi-purpose stripper designed to remove old coatings and sealers, as well as any adhesive and paint stains, and Tile Doctor NanoTech HBU, a powerful cleaner which utilises nano-sized particles to penetrate difficult-to-reach areas of the stone to eliminate deep lying dirt and stains. 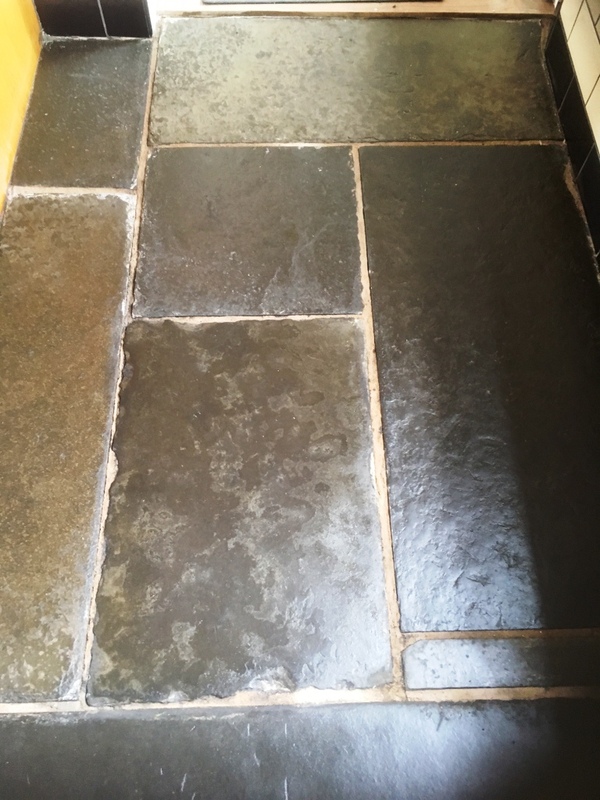 This potent cleaning solution was left to dwell on the surface of the floor for 45 minutes before being worked deep into the stone with a poly brush fitted to a buffing machine. The resultant cleaning slurry was then hoovered up with wet-and-dry vacuum. Next, the floor was rinsed and cleaned with just clean water and the slurry was once again hoovered up. This left the tiles clean and fresh, so I turned my attention to cleaning the grout lines in detail, which also involved spot cleaning any stubborn grout smears with Remove and Go and Tile Doctor Acid Gel, which is a blend of Phosphoric and Hydrochloric acids in gel form designed to remove stains of this kind. 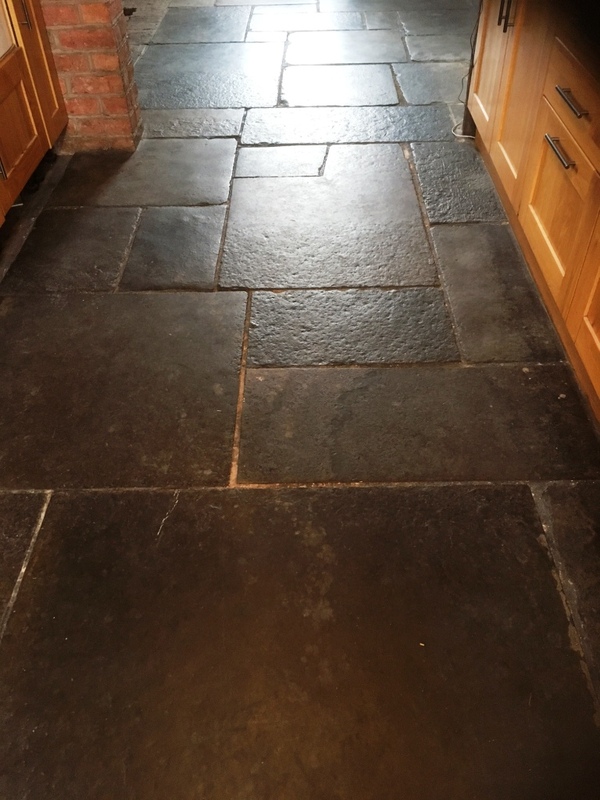 When satisfied with the result of the cleaning process, I rinsed the floor for a final time with fresh water, hoovered up as much moisture as possible with a wet vacuum and left the stone to dry off fully overnight. On arrival at the property the following day, I checked the floor for dampness with my damp meter. The test proved that no excess moisture was present, so I proceeded to give the Flagstone a fresh seal. 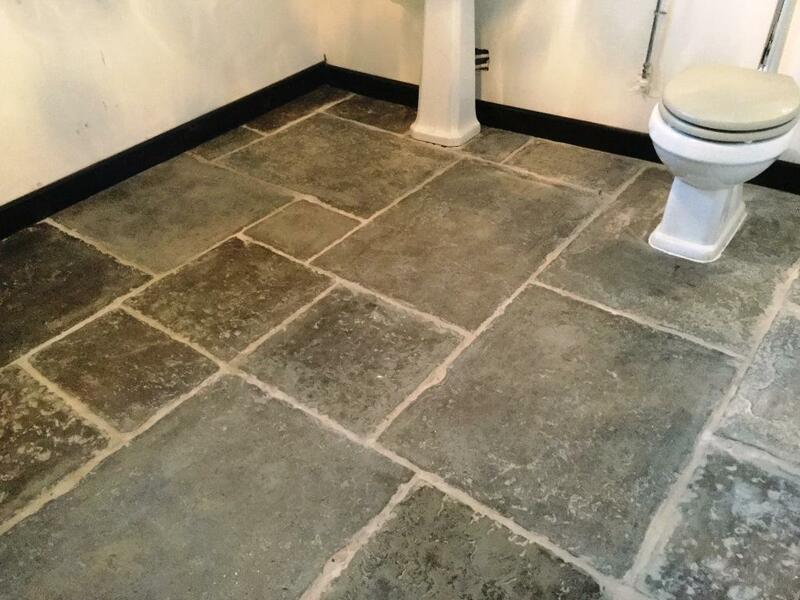 With regards to sealer choice, the customer had requested a natural-looking matte finish to match in with the rustic characteristics of the Flagstone, so I used Tile Doctor Colour Grow – which provides exactly that. Colour Grow is a durable impregnating sealer that also enhances the natural shades in the stone to really bring the whole floor back to life. Roughly an hour was left between the application of each coating of sealer to allow the floor dry before applying the next. 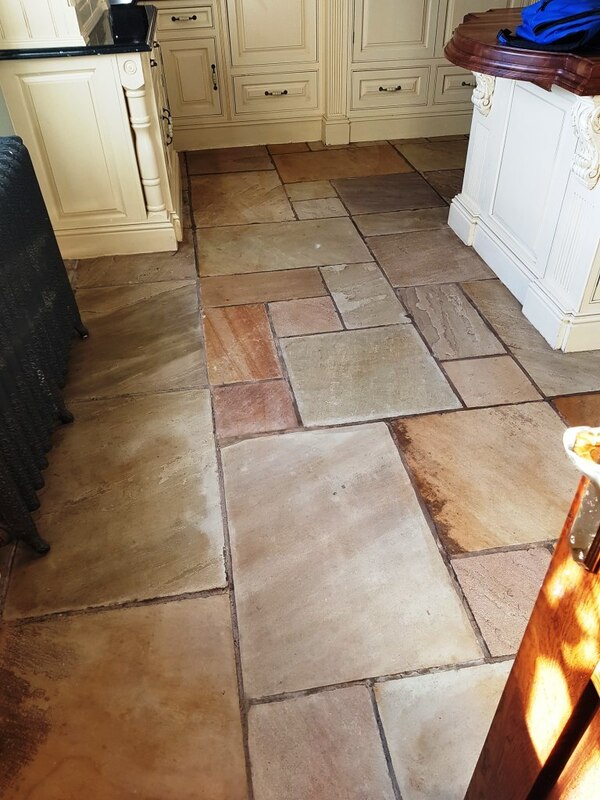 The result was a noticeable improvement in the condition and appearance of the Flagstone – and the customer couldn’t have been happier. It’s always satisfying to breathe some new life into old natural stone tiles. 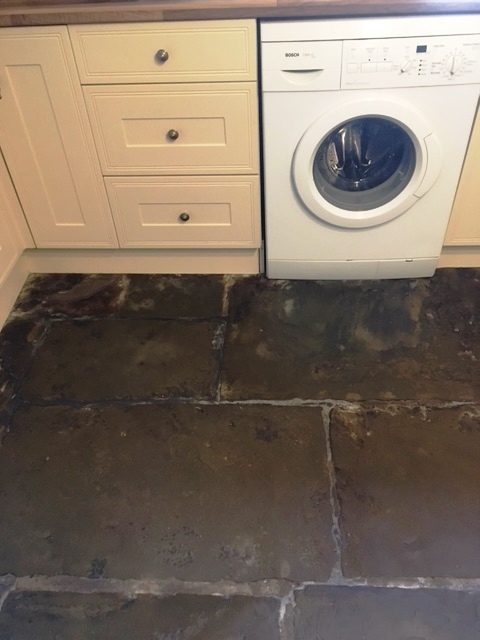 This customer in Grange-over-Sands, a town on the Morecambe Bay, contacted us because an oven cleaning company had spilt a strong cleaning solution onto their Sandstone Flagstone Kitchen tiles, damaging them. The customer hadn’t realised the damage until after the oven company had been paid, and because nothing had been said at the time the cleaning company unfortunately wouldn’t accept responsibility. 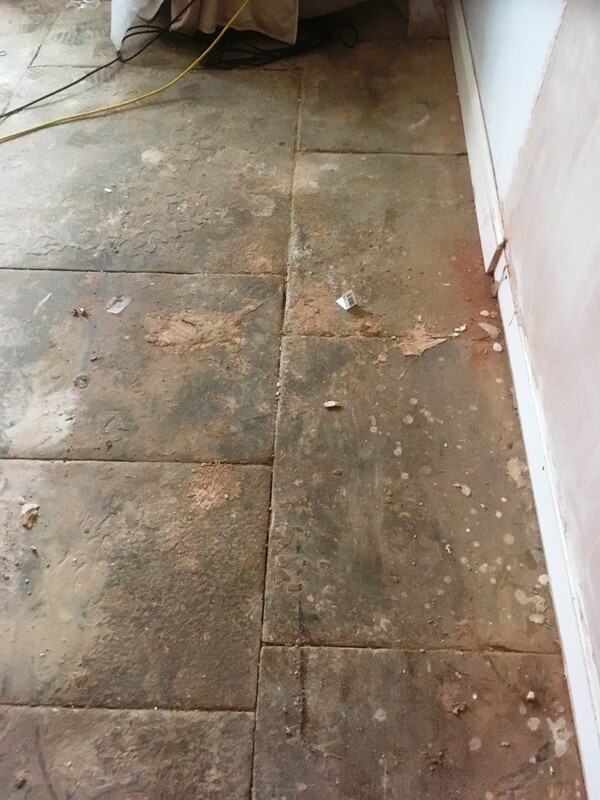 When we arrived at the property, we were asked to do a spot clean on the affected tiles, however to do so would have resulted in a patchy finish compared to the rest of the floor. However, we could see that the rest of the floor was well overdue a deep clean and the sealer was past its best. So, we suggested the best course of action was to deep clean and reseal the whole floor to ensure a consistent finish across the tiles. The customer agreed to the work, and we started on the same day. To begin, we used a Coarse 200 grit diamond encrusted burnishing pad fitted to a heavy weight buffing machine to grind away the damaged layer of stone. This worked well on about 90% of the area, but the harder to reach spots needed a chemical clean, so Tile Doctor Oxy-Gel cleaner was applied. This is an alkaline-based gel cleaner that is effective for neutralising acidic stains. The product was left to dwell for 30 minutes and then scrubbed into the tiles, before being rinsed away. Following this, we extracted the dirty solution off the tiles using a wet vacuum. Since we used quite a lot of water to rinse away the chemically-infused cleaning solution, we had to leave the floor to dry overnight before we could seal it. This is really important because excess moisture can cloud the sealer and damage its performance. Arriving back at the property the next day, we ran some damp tests. Once satisfied that the tiles could be sealed, we applied four coats of Tile Doctor Seal and Go. This sealer provides an aesthetically pleasing, low-sheen finish and is fully breathable. 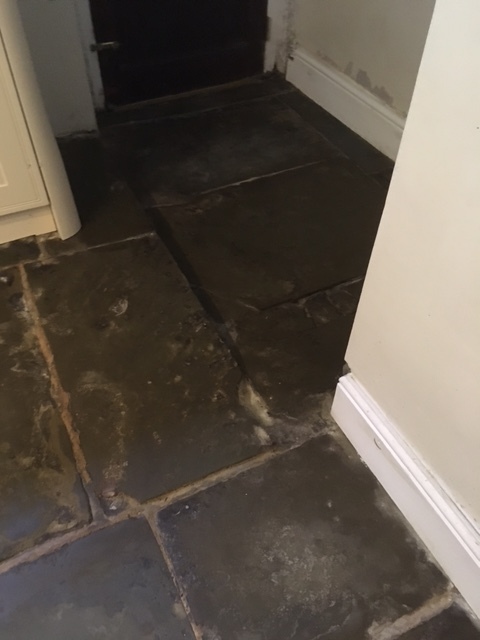 Most of the old Flagstone tiled floors found in properties don’t have a damp proof membrane installed underneath them, so a sealer which allows for moisture vapour transmission is essential. 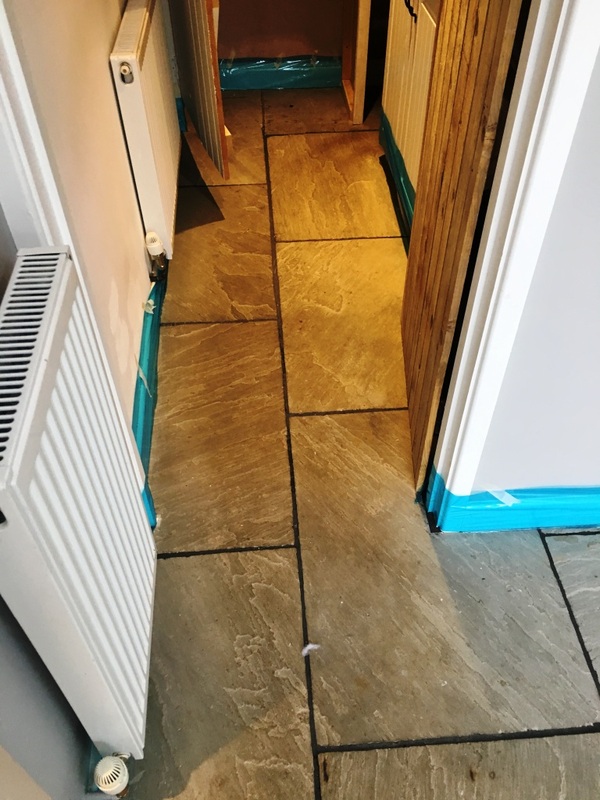 The customer was very happy with the work, not only because we restored the condition of the damaged tiles, but also because we were able to drastically improve the overall appearance of the floor. 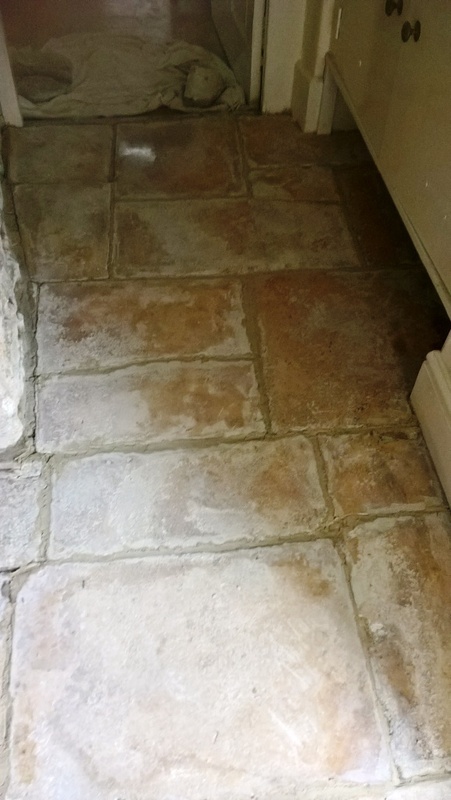 We recommended that the customer use Tile Doctor Stone Soap as a regular aftercare cleaner. This product not only cleans the stone, but adds to the natural stone patina by maintaining and enhancing its shine. 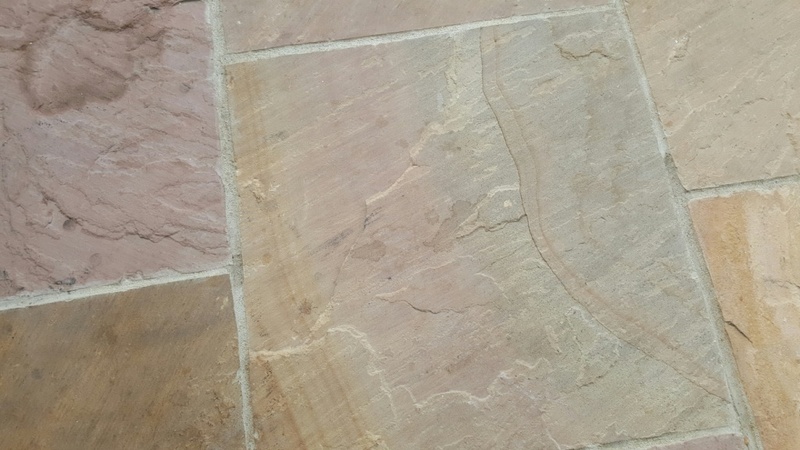 Flagstones are a durable Sandstone based material that give a solid feel to any floor, however while large and impressive to look at they can be very rough and un-even. 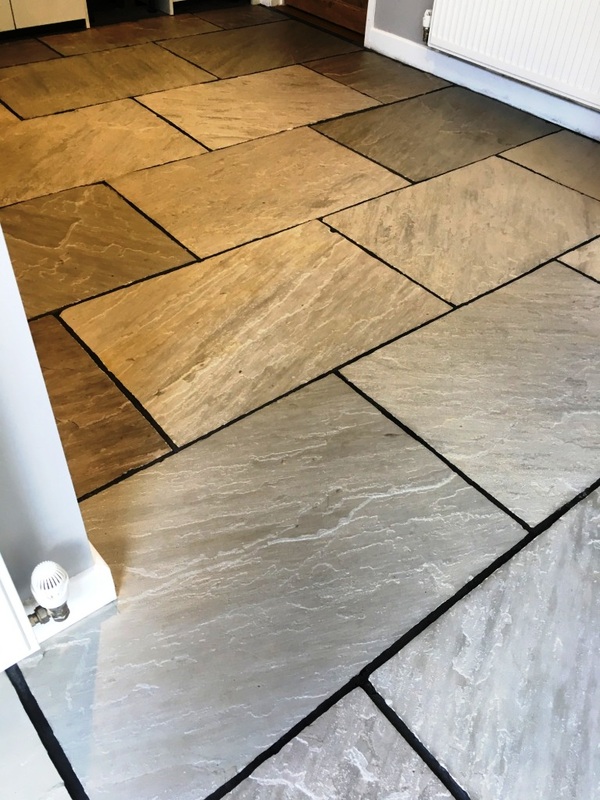 This isn’t so much of a problem when Flagstones are used externally for patios and pathways, but rough surfaces trap dirt and when these tiles are used internally, they are much easier to maintain if the stone is smooth and sealed. 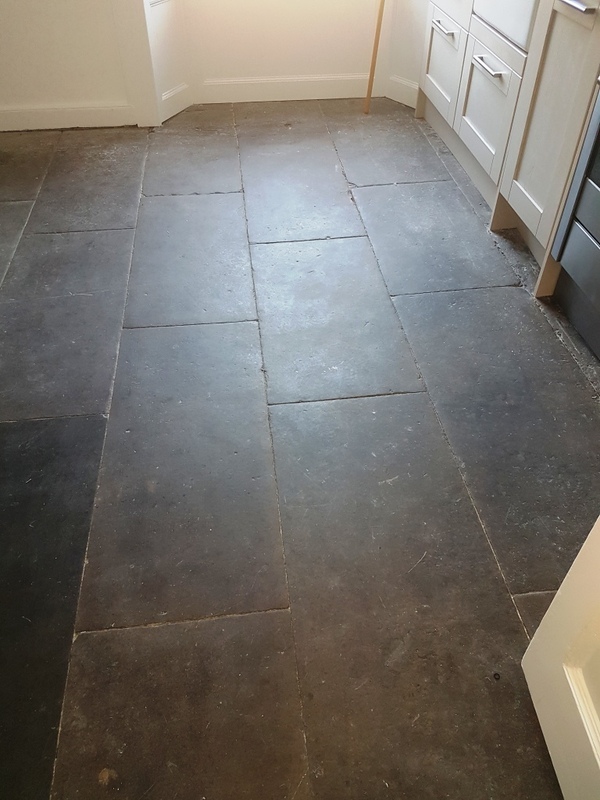 This customer, who lives in the Lancashire town of Haslingden, had this problem with their Flagstone tiled floor and like most things related to tile, stone and grout we have a solution in the form of a process known as milling. This basically involves grinding down the surface of the tile using coarse diamond encrusted pads to make it smooth. The customer booked me in to get the job done, having seen some previous milling work of ours on our website and liking what we had achieved for other people with similar floors. Milling the stone involves the use of a set of thee millings pads of different grades (50, 100 and 200 grit) which are applied in sequence. You start with the coarse and abrasive 50 grit milling pad and follow this by smoothing this surface with the finer 100 and 200 diamond grit milling pads. Water is used to lubricate and capture the dust which is created during the process resulting in a slurry which needs to be rinsed away and extracted between each pad. The process requires the use of a solid weighted rotary machine and a fair bit of muscle power to guide it. 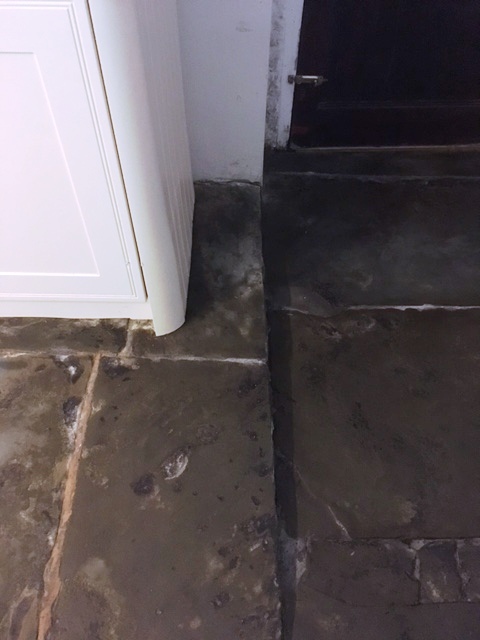 We successfully managed to mill the Flagstone tiles virtually flat in places and the process removed the unappealing stained and dirty layer of stone that was ruining the appearance of the floor. Interestingly we usually find that by grinding away the old and dirty layer of stone the true colour of the tiles that had been hidden under many years’ worth of muck is revealed. Unfortunately, in this case, due to the darkness of this stone it was difficult to see a great deal of colour change. Finally, the floor needed to be sealed to protect against future instances of staining and ingrained dirt. To do this I sealed the tiles using several coats of Tile Doctor Colour Grow, which is an impregnating, colour enhancing sealer that soaks into the pores of the stone and occupies that space preventing dirt from become ingrained. 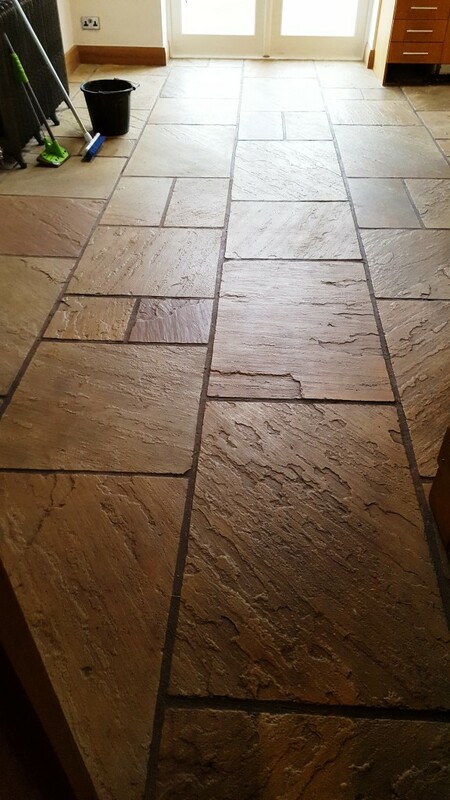 The sealer also leaves a matte, natural looking finish, which is a perfect match for the rustic character of the Flagstone tiles. Now that the floor has been levelled and sealed, the surface is smooth and protected. This means the customer will not be ruining any more mops when the cleaning bucket comes out! Property renovation can be a busy and chaotic process, especially when some of the work falls short of your expectations. 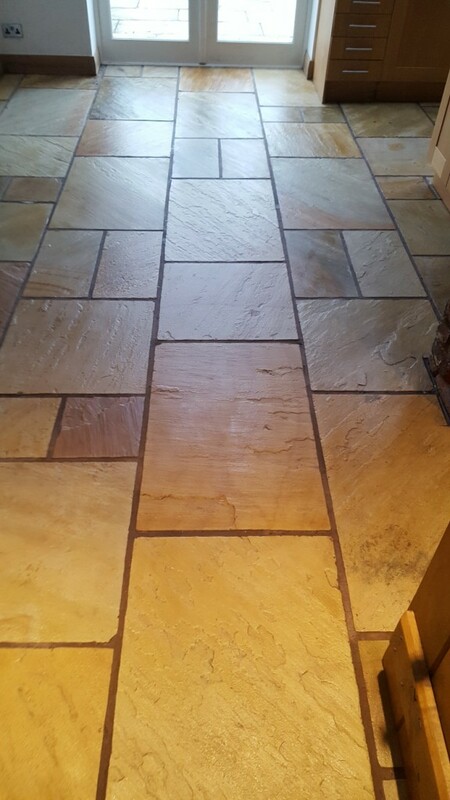 This customer, who lives in the tiny Bedfordshire village of Moggerhanger (pronounced locally as ‘Morhanger’), called me in as he was not happy with the appearance of a newly laid Flagstone tiled floor in the kitchen, dining room and downstairs WC. 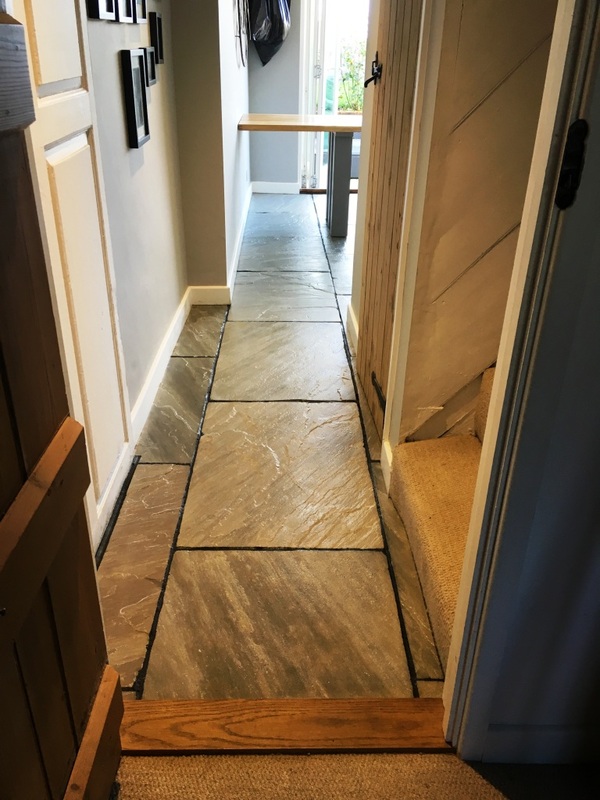 There was extensive renovation work taking place at the property and the customer had been let down by his tiler, as a result he agreed to allow his builder to lay the Flagstone tiles. Unfortunately, the installation was not completed properly and the grout haze quickly emerged. What’s more, there was a significant quantity of adhesive staining on the surface of tiles, left over from the decorating which had not been removed. The customer needed help to get the floor looking the way it should and we were more than happy to help. The photo below shows the extent of the grout haze present in the WC area. I was able to remove this successfully by using Tile Doctor Grout Clean Up which is a concentrated phosphoric acid cleaner designed to penetrate below the surface to remove grout haze, mineral deposits, rust stains and efflorescence. This product was scrubbed into the grout using a rotary machine fitted with scrubbing brushes. The soiled cleaning residue was then removed using a wet-vac machine. Any stubborn areas of grout haze were given a second treatment, followed by a washing and rinsing. 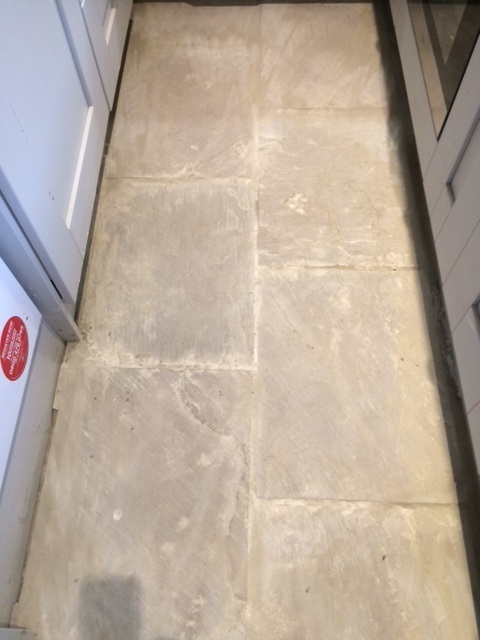 The next photo shows this area after an application of Tile Doctor Stone Oil which soaks into the stone to enhance the natural colours and texture. I allowed the area to dry for 24 hours before sealing with Tile Doctor Seal & Go which adds a nice sheen to the tile as well as further protection. The next pair of photos show the staining of the kitchen tiles including a close-up shot. 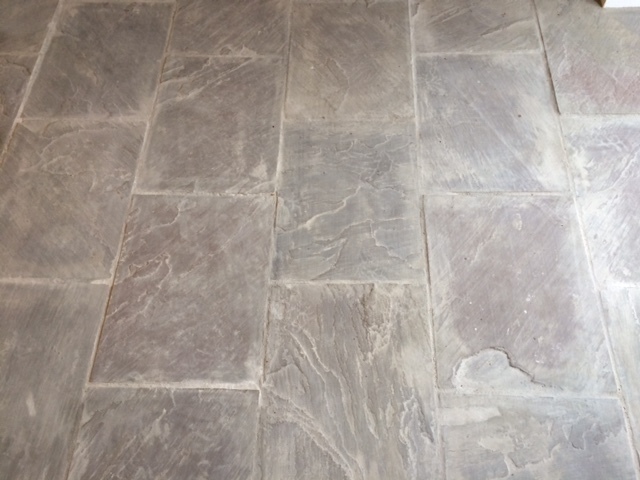 I was able to remove the staining using a stiff rotary brush in combination with our reliable alkaline cleaner Tile Doctor Pro Clean, which was followed by an application of Grout Clean-Up to remove any particularly stubborn deposits. 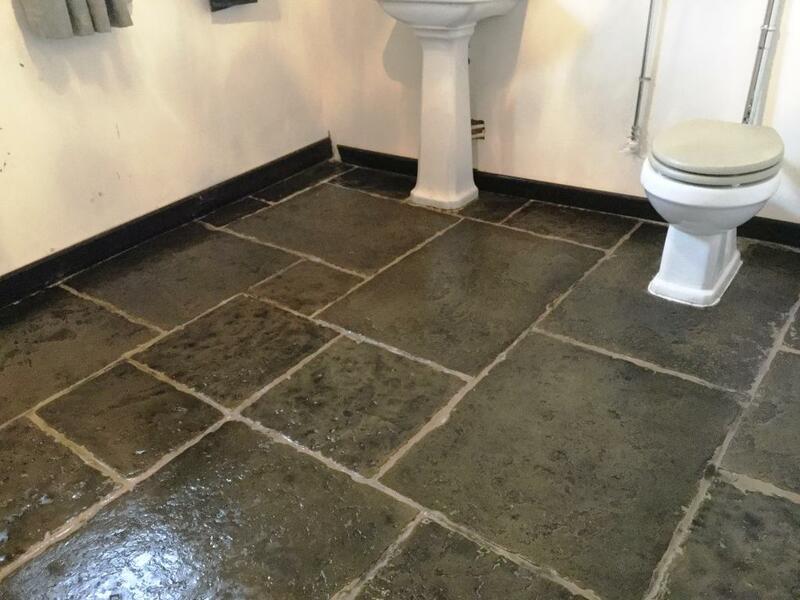 The floor was allowed to dry for twenty-four hours before being sealed in a similar way to the bathroom using three coats of Stone Oil and three coats of Tile Doctor Seal & Go. The final photos show the finished floor. Finally, I was asked by the customer if I would help the builder out by assisting with grouting the entire kitchen due to time restraints and because the customer wanted to get the room back into use as soon as possible. Together we finished grouting the entire area correctly, made much easier by the fact that I had already sealed the floor. New grout was left to dry for a further 24 hours, before I returned to give the floor a light clean and two further coats of Tile Doctor Seal & Go to ensure the new grout was sealed and adequately protected. Our tiled floor restoration services have attracted a number of high profile customers over the years. 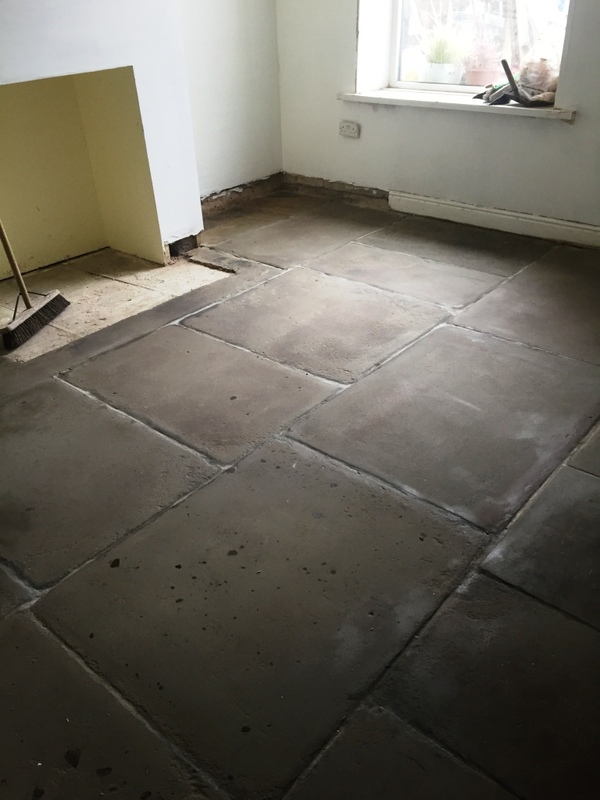 In fact, not too long ago I was contacted about restoring a Flagstone tiled floor at a property in Edinburgh belonging to a Scotland international footballer. The tiles and grout were in real need of professional cleaning and sealing because it clearly had not experience adequate maintenance in a while. Here’s a quick overview of how I was able to get the floor back to looking its best. First of all, we cleaned the tiles and grout using a mix of two products: Tile Doctor Pro Clean and Tile Doctor Remove and Go. Pro Clean is our high alkaline cleaner and is a very reliable product for removing soil from natural stone. Remove and Go serves the more specific purpose of stripping away any old sealer and breaking down any paint and adhesive stains. before extracting any dirty slurry with a wet-vac machine. I did this several times until I was happy the floor was clean to the best possible extent. I also filled in any missing cement in joints and then installed drying equipment to help dry out the Flagstone tiles overnight. Upon returning to the property the following day I did a quick check for any damp issues. Thankfully none were present, so I was able to proceed with sealing the tiles using seven coats of Tile Doctor High Shine. This sealer is a specially formulated water-based blend of acrylic polymers, providing both a stain resistant surface seal and a durable high-sheen finish. By doing so it eliminates the need for sealing using two products to achieve that effect. The restoration process was really transformative, as you can see from the photos above. The tiles compliment the design of the property very nicely and it’s great to know that they can now be kept looking fantastic for longer. Another satisfied customer! 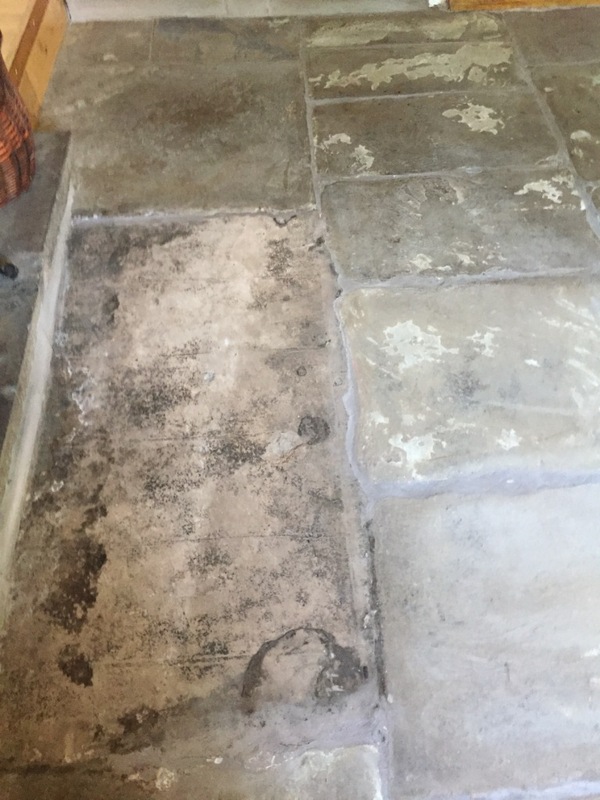 This Flagstone tiled floor at a cottage in the market town of Chorley was suffering from significant shaling issues, which came as no surprise when I heard that the stone was laid nearly 300 years ago. 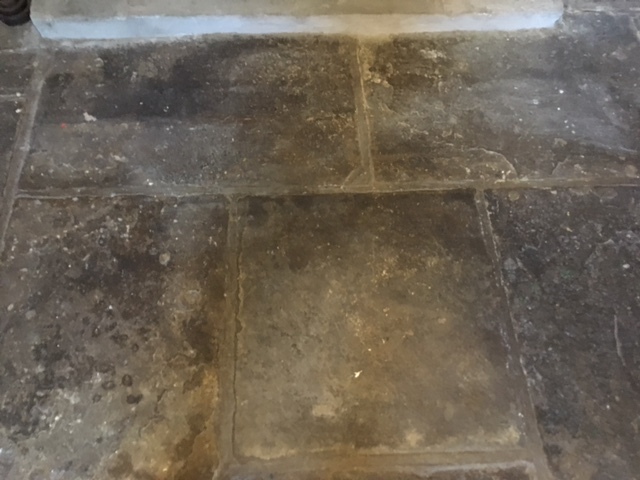 The floor is an original feature of the property, but over recent years it had started to flake and become very rough, making it very difficult to keep clean, uncomfortable to live with, and not very pleasing to look at. The process is natural to the Flagstone, and some people are quick to assume nothing can be done to counter it. In fact, the cleaning company that the property owner had recruited was only able to give the stone a basic mop, and had suggested having the entire floor replaced. The property owner was about to give up on the floor, but instead contacted Tile Doctor to see what could be done. At Tile Doctor, we have created a process known as Milling, which involves smoothing out the rough surface of the stone, making it easier to keep clean. To do this we attached several diamond encrusted disc shaped milling pads of varying coarse grits to a rotary machine before running the machine over the floor, effectively grinding down the stone to remove the rough and leave the worn floor polished and looking at its best again. I used plain water to periodically wash away any residue from the Milling, and soaked up the excess moisture with a wet-bad machine. 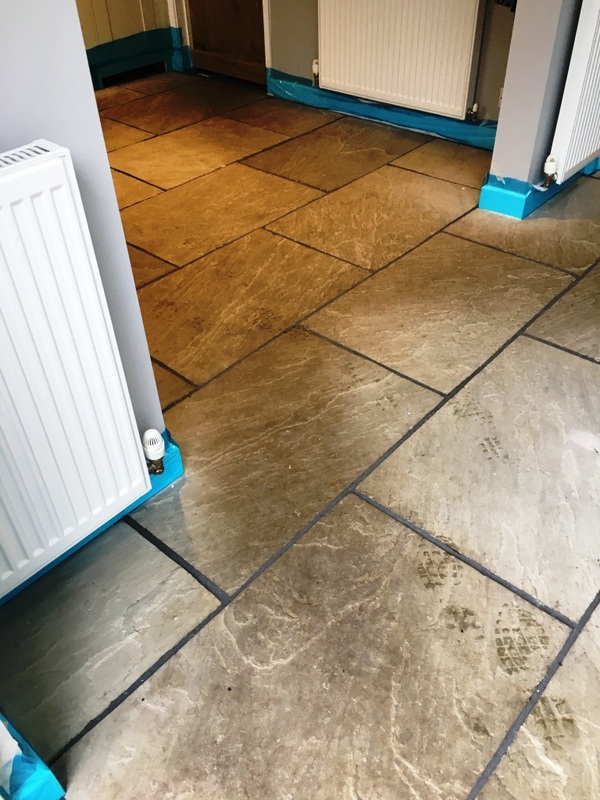 With the floor surface now serviceable, the customer’s preferred cleaning company can mop it effectively without the mops being shredded by the jagged and uneven stone! To further ensure that the Flagstone would be easy to keep clean it would need to be sealed with an appropriate sealer. 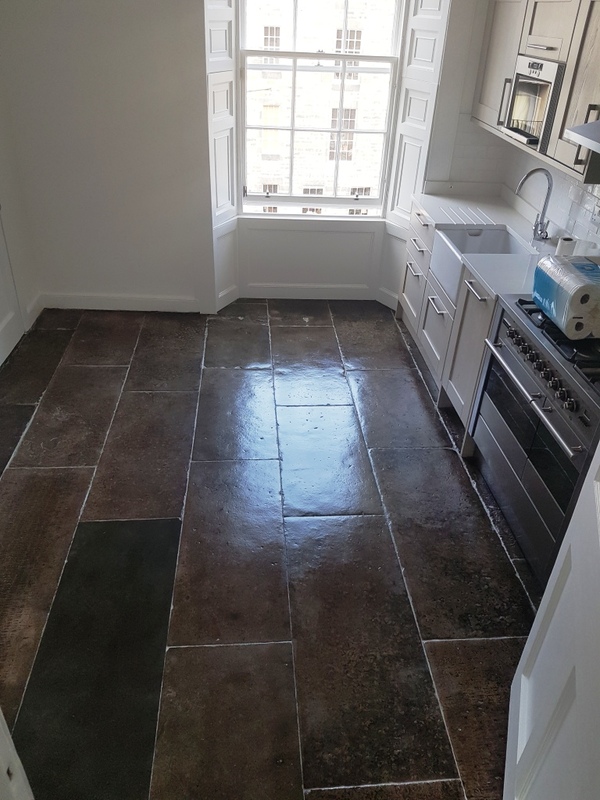 Once the floor had been allowed to dry fully, I applied two coats of Tile Doctor Colour Grow, an impregnating sealer which provides a matte, colour-enhancing finish. 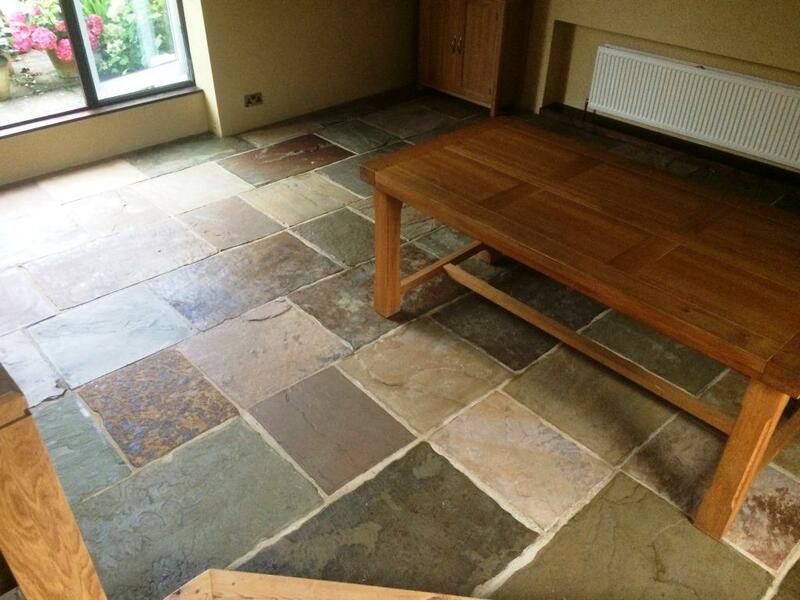 As you can see from the before and after photographs, this really brought out the natural shades in the Flagstone. As a fully breathable sealer which allows for Vapour Moisture Transmission (VMT), Colour Grow is the best product for an old floor like this one which does not have a Damp Proof Membrane (DMP) fitted. Whereas a lot of other similar sealers will not suffice, Colour Grow is ideal in this particular situation. The results were fantastic, and the customer is really pleased that they will no longer have to replace the tiles. 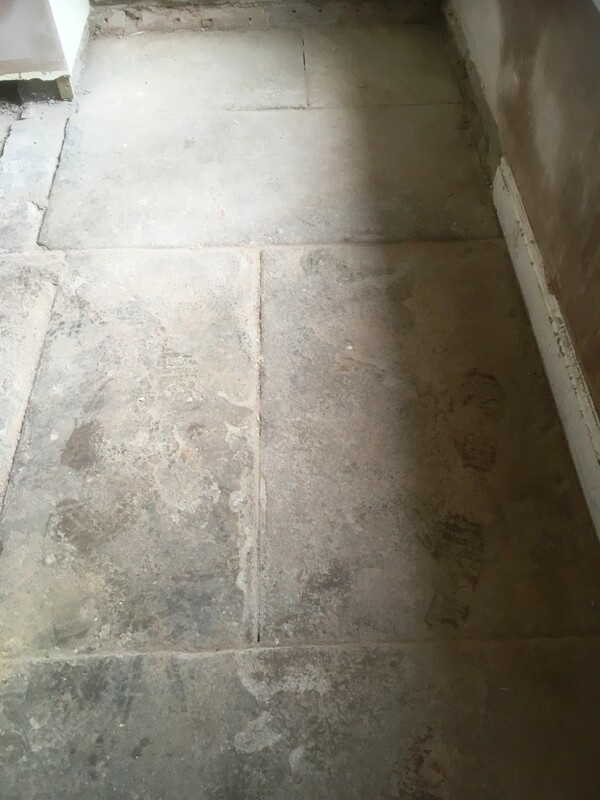 The appearance and condition of the Flagstone had been improved so much that most people would not believe it had been laid nearly three centuries ago! 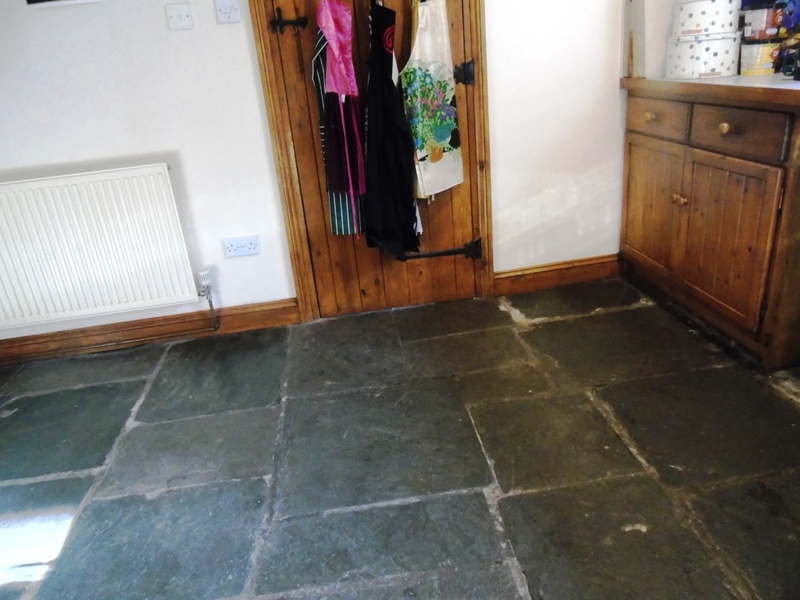 This Indian Fossil Sandstone tiled floor in Skipton was in a terrible state. 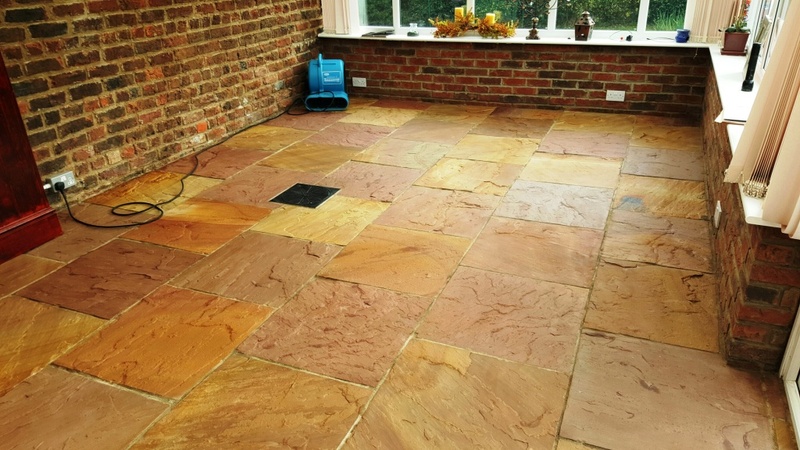 Indian Sandstone, sometimes known as Indian Sandstone Flags, are an alternative to Yorkshire Sandstone (or ‘Yorkstone’), which is known for being particular hard wearing and high quality. Nonetheless, the problems with the floor were not due to the quality of the stone, per say. 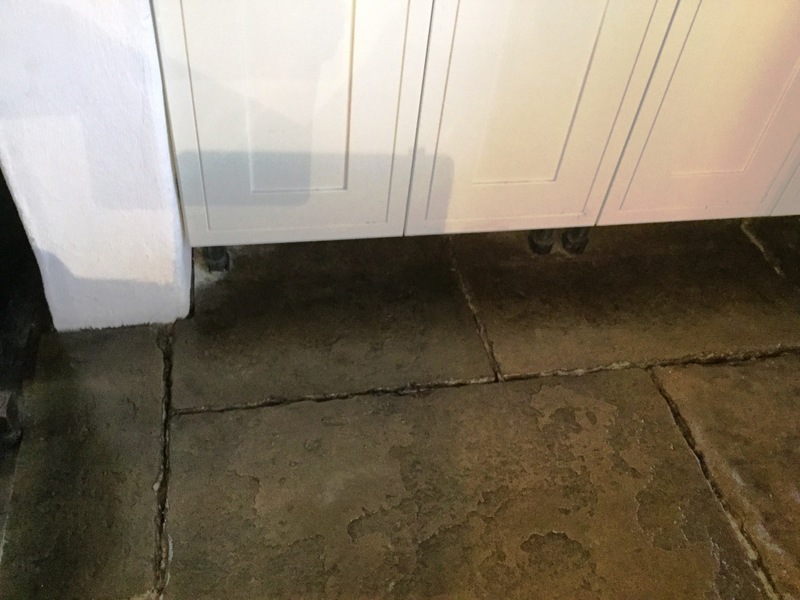 Rather, the floor’s poor condition was caused by a lack of sealer, allowing the floor – and by extension the entire house – to become very dusty. In addition, the grout lines had been pointed with cement and sand instead of normal grout, which simply made the floor look messy and poorly cared for. I was called down to the property to set the situation right by providing a deep clean and fresh seal. I started the job by dealing with the unsightly cement splashes around the grout lines, breaking them down manually using a good old fashioned hammer and chisel. Nonetheless, my main concern around the grout lines was the grout haze caused by the excess cement. 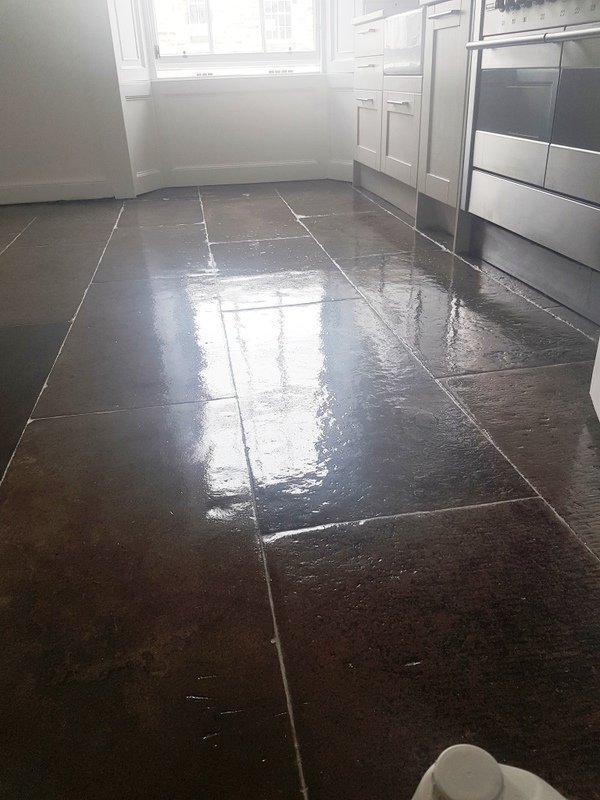 To neutralise the haze I carefully treated the grout lines with a phosphoric acid cleaner known as Tile Doctor Grout Clean Up, this product removes mineral deposits such as excess cement leaving the surface looking a lot tidier. The floor was then rinsed with water to remove the acid cleaner. To round off the cleaning process, I mixed a solution of one part Tile Doctor Pro Clean to four parts clean water, before applying it to the tiles and scrubbing it in with a black pad fitted to a rotary machine. This helped to remove the ingrained dirt caused by a lack of sealer and clean the area ready to receive a fresh seal. I left the property to allow the floor to dry over night. Upon my return the next day, I checked for excess moisture and, once satisfied the floor was dry, I proceeded to seal the floor with four coats of Tile Doctor Seal & Go. Seal & Go is a water-based topical sealer designed to build up stain resistant protection on the surface of the floor and to allow moisture vapour transmission. It is typically used to seal internal, unsealed porous surfaces, including Sandstone, Quarry and Victorian tiled floors. 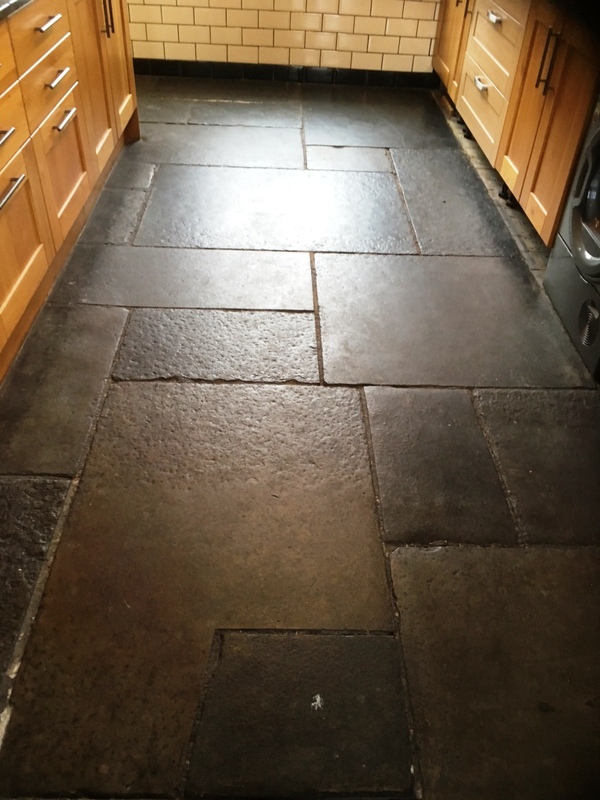 Given the awful original condition of this floor, the results achieved over the space of two days were very good. Certainly my customer was very pleased with the transformation. The addition of a robust surface seal will go a long way to ensure the floor doesn’t fall back into such a bad state again. These photographs are from a fantastic barn conversion in the town of Newark, Nottinghamshire. 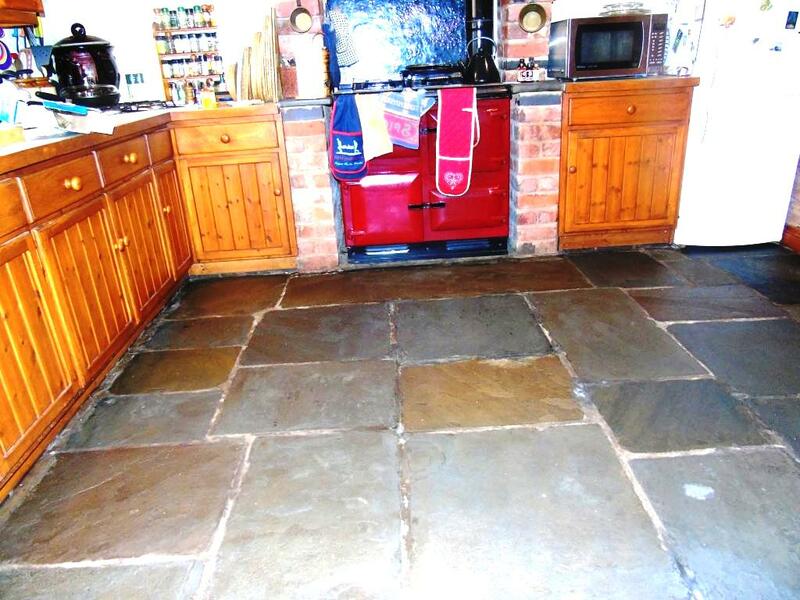 The owners of the property, however, were unhappy with the state of their modern Sandstone Flagstone tiled floor, which was looking dull and tired. 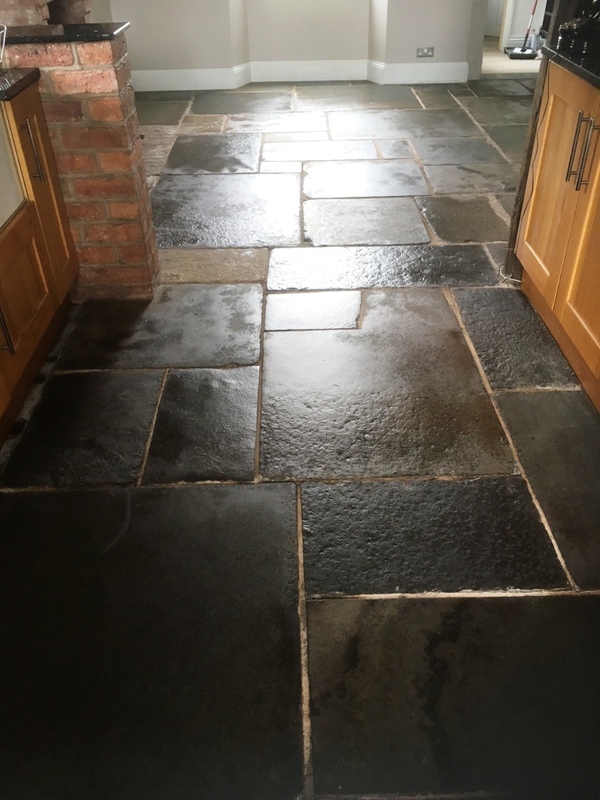 Flagstones are typically quite hard-wearing and durable but will need proper maintenance over time and I was called in get them looking like new again. 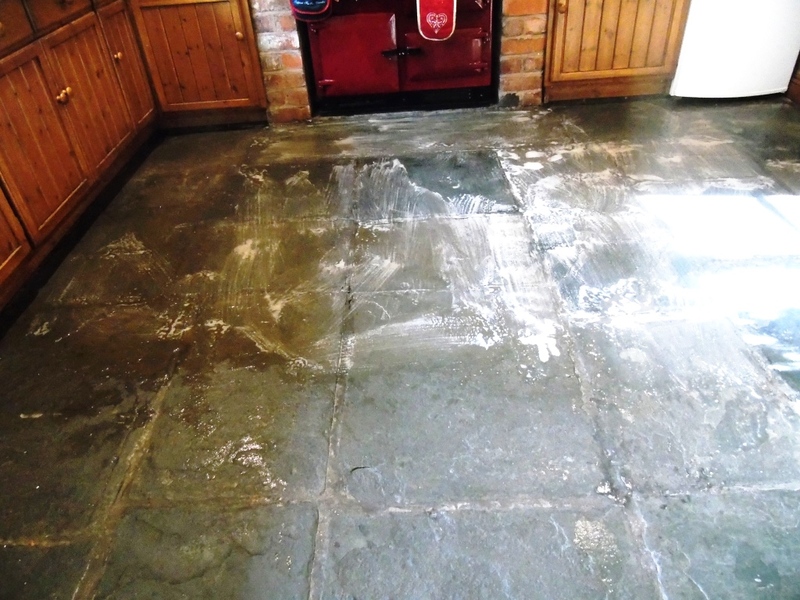 Firstly, I mixed a solution of one part Tile Doctor Pro-Clean, which is a high alkaline cleaner, to 10 parts water; this was then applied to the floor and left it to dwell for 15 minutes before agitating the solution into the Flagstones with a scrubbing brush fitted to a low-speed weighted rotary machine. This helped to remove the soil build-up and also break down the old sealer, the resulting residue was promptly removed using a wet-vac machine and the entire floor rinsed with fresh water. Following the clean, I installed two whole room air mover driers to accelerate the drying of the floor overnight. 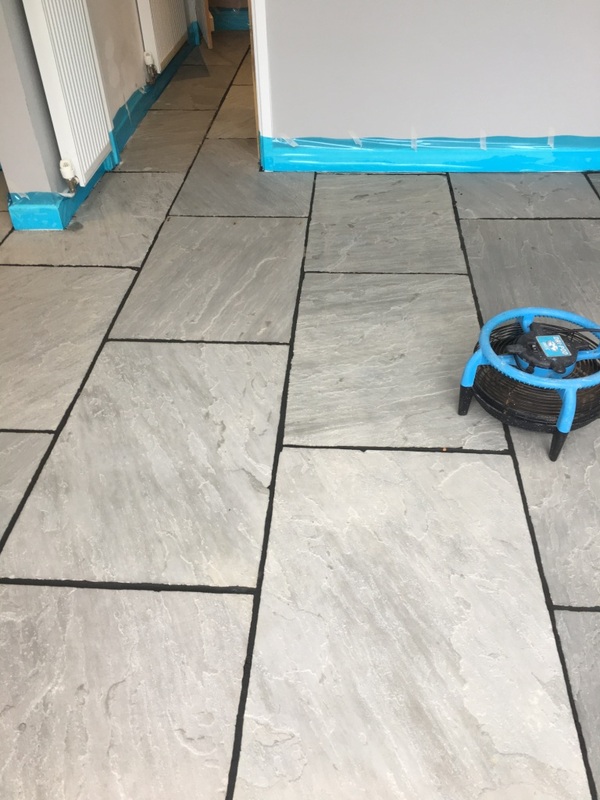 It is essential to ensure any tiled floor is completely dry before sealing, as excess moisture has the potential to upset the performance of the sealer. On my return the next day, I ran some damp tests to check for excess moisture. Once I was satisfied that the floor was ready to seal, I applied a total of four coats of Tile Doctor’s colour intensifying, topical sealer, Colour Grow. 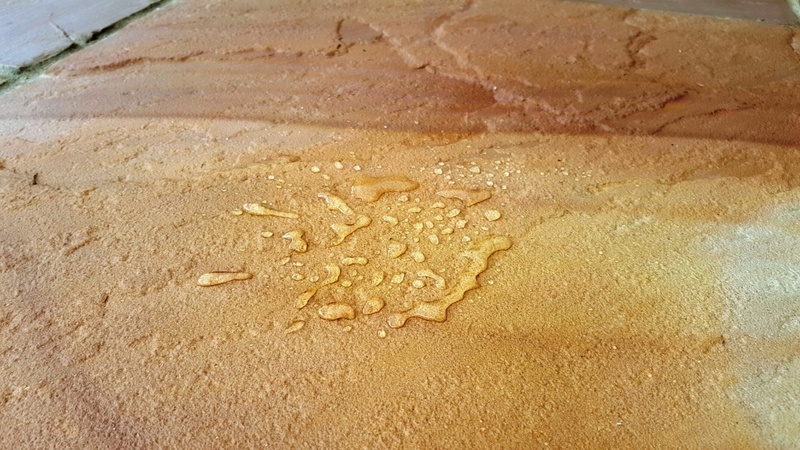 The sealer impregnates the stone, providing durable protection from within, and thereby protecting the stone from soil ingress, and both oil and water based spills. Colour Grow was the ideal choice of sealer since my clients did not want a shiny finish, and this product dries matte in appearance whilst enriching the natural mineral colours in the stone. After completing the job, I made sure to offer my clients some day-to-day cleaning advice. The simplest form of maintenance is damp washing with a mop, using Tile Doctor pH Neutral Tile Cleaning Solution, providing that is has been correctly diluted. I also recommended changing the mop water every 7-10 metres squared, to help avoid suspended soils from being re-deposited back onto the surface of the floor. Recently, I was asked to visit a property in the small port town of Boston, Lincolnshire, to quote for a clean and seal. 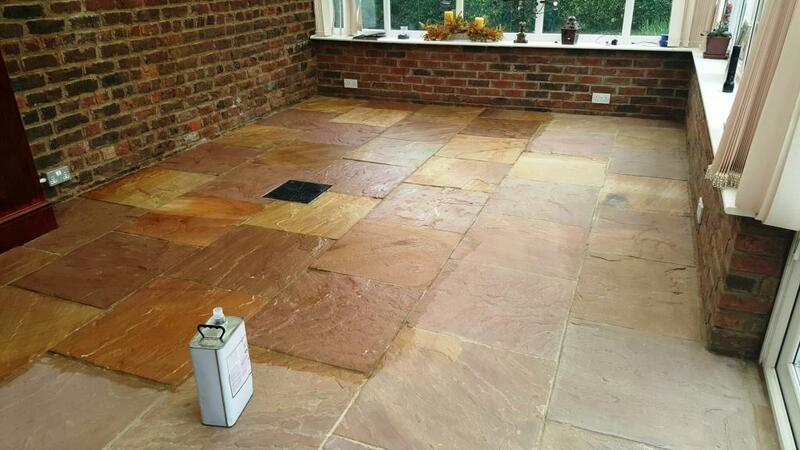 My client had recently moved into a new home, but the riven natural Sandstone flagstone floor had not been properly cared for or sealed by the previous owners and was now in need of a thorough clean. 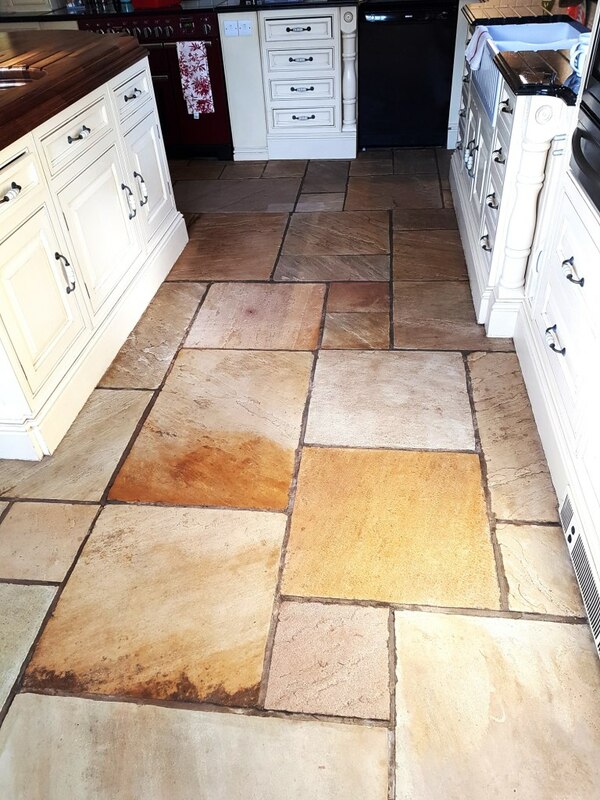 Sandstone flagstones are a popular choice for both residential and commercial use, and are especially popular in kitchens and hallways. 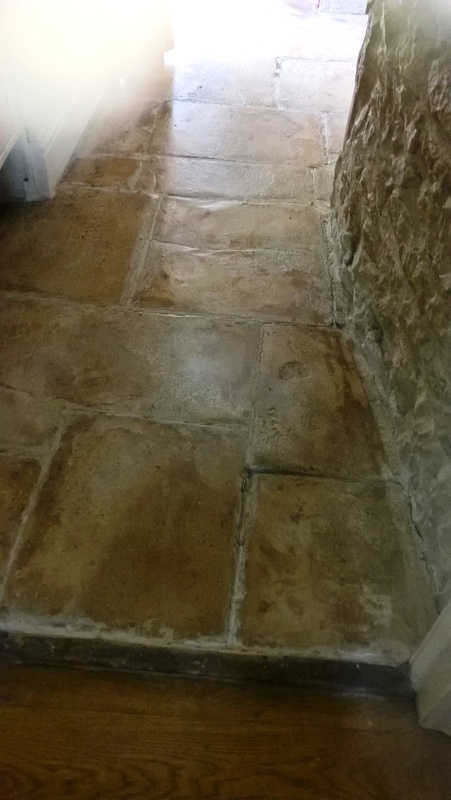 This particular floor was blemished by noticeable stains that had seeped into the stone. Further liquid stains were visible in other areas of the floor, as they had soaked into the stone due to the lack of a surface sealer. My primary tasks would be removing these blemishes and to provide a stain resistant surface seal to prevent damage in the future. My client also requested a natural look finish to the floor rather than a topical shine seal. This was a two day job. On day one, my main focus was on eliminating the stubborn stains on the stone tiles. 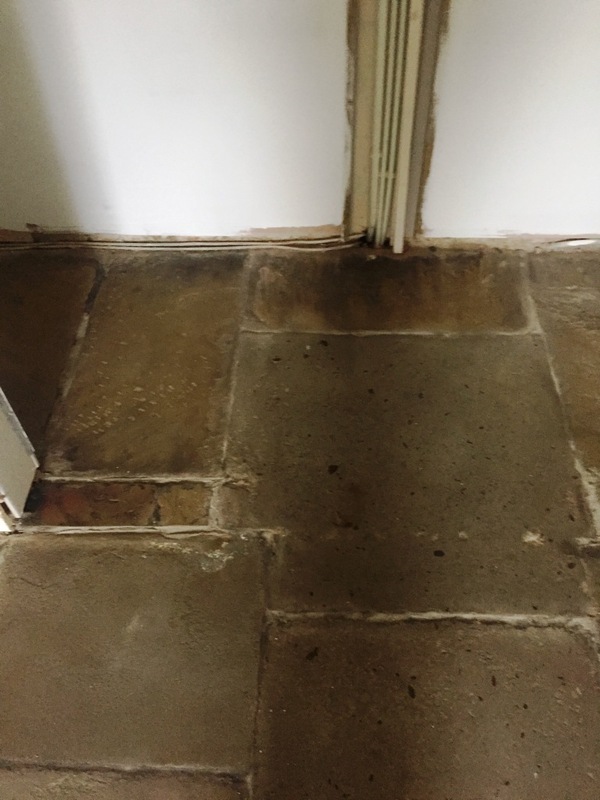 I mixed a strong solution of Tile Doctor Pro-Clean, a high alkaline cleaner, with water to tackle the heavy soil build-up and applied the solution to the floor in sections leaving it to dwell for a short period first so it could get underneath the dirt and lift it to the surface. I then used a combination of a stiff brush and a specialist Rotovac machine to scrub and clean the floor. 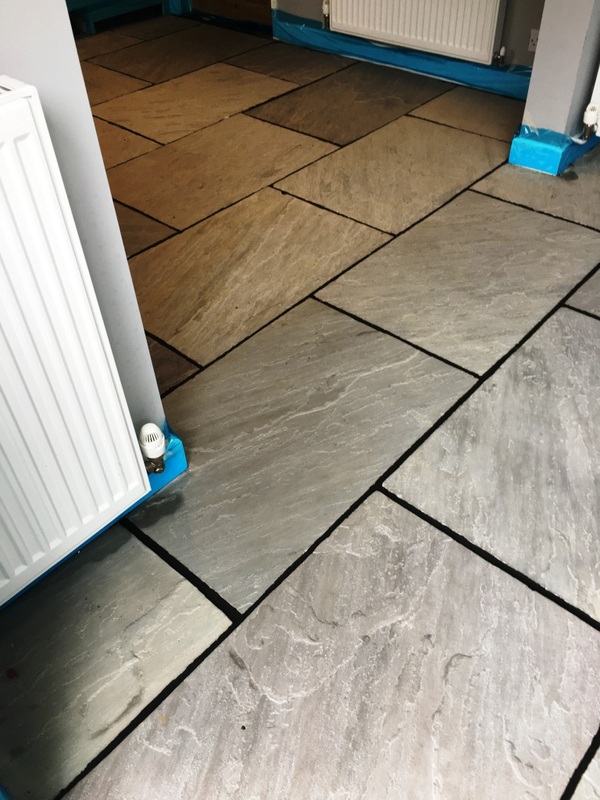 The Rotovac uses water under high pressure to clean the floor and is highly effective in eliminating the difficult-to-reach dirt, particularly where it might be hidden due to the riven nature of the tiles. The cleaning process was repeated until I was satisfied with the results. After finishing the clean I left the house, allowing the floor to dry off overnight. On day two, I returned to the house and ran damp tests to ensure that the surface was completely dry before commencing the seal. My choice of sealer was Tile Doctor Colour Grow. As an impregnating sealer, this product soaks into the stone to provide robust protection from within. It also contains a colour intensifier and so, as you can see from the photographs, it really helped to enhance the natural shades in the Sandstone. My client was delighted with the results and I think you will agree the floor looks transformed and much more appealing. 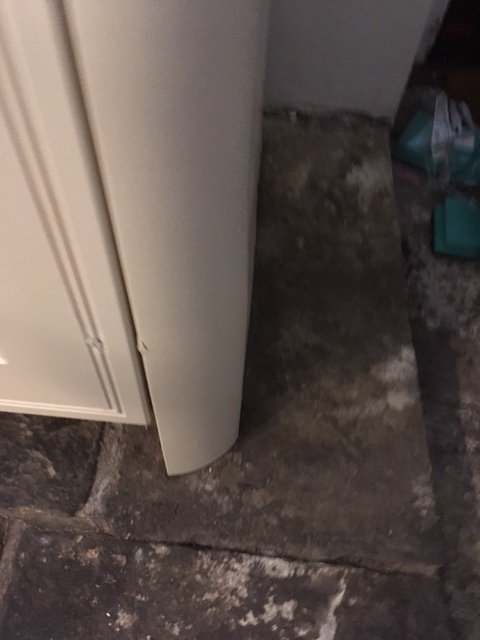 Additionally the sealer is now protecting the stone from staining and liquids form puddles on the surface of the tile instead of soaking into its pores.